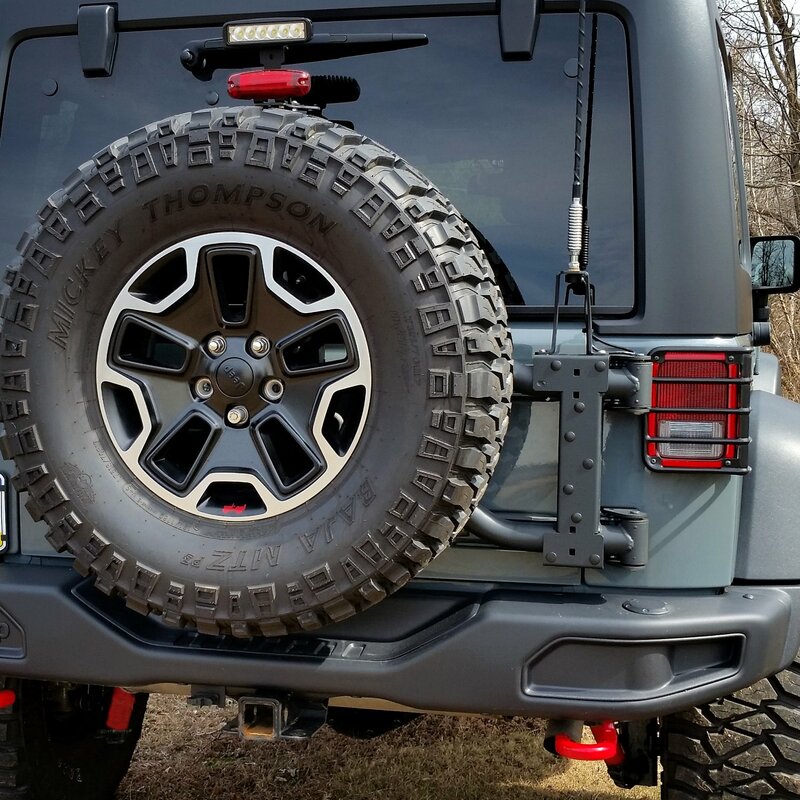 In this article, we will be replacing our factory Rubicon X spare tire carrier with the Maximus-3 JK Modular Tire Carrier Sport Package. 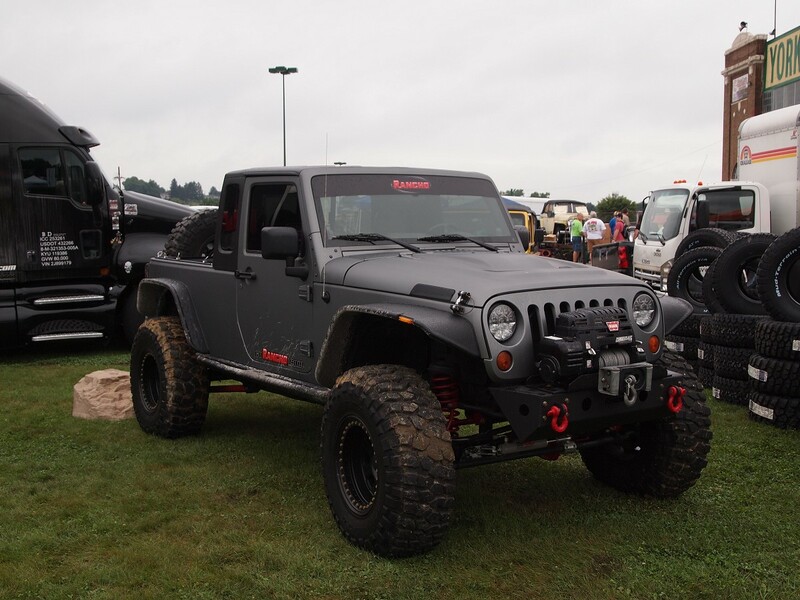 The Maximus-3 JK Modular Tire Carrier is designed specifically to fit the Jeep Wrangler JK model years 2007-2016 in a straight forward 100% bolt-on installation requiring no drilling or cutting. 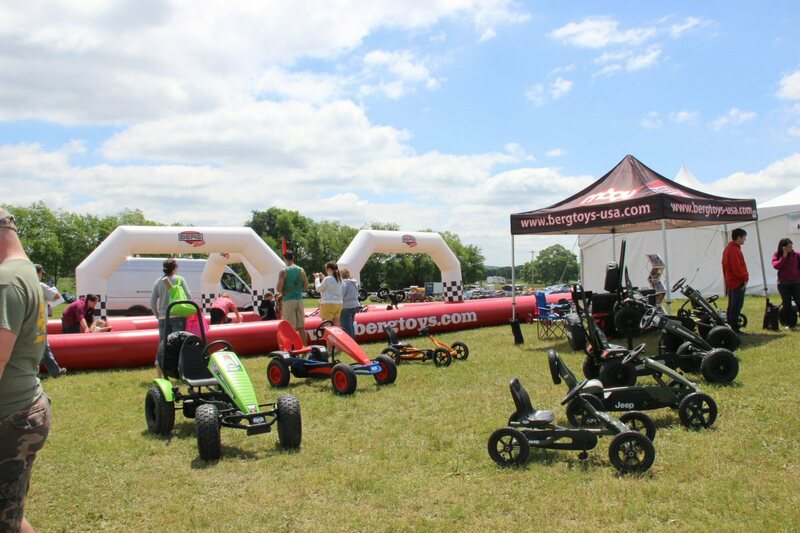 Designed and fabricated in the U.S.A. it is engineered to be adjustable to allow for different tire size configurations and modular to allow for various accessory and equipment installations. 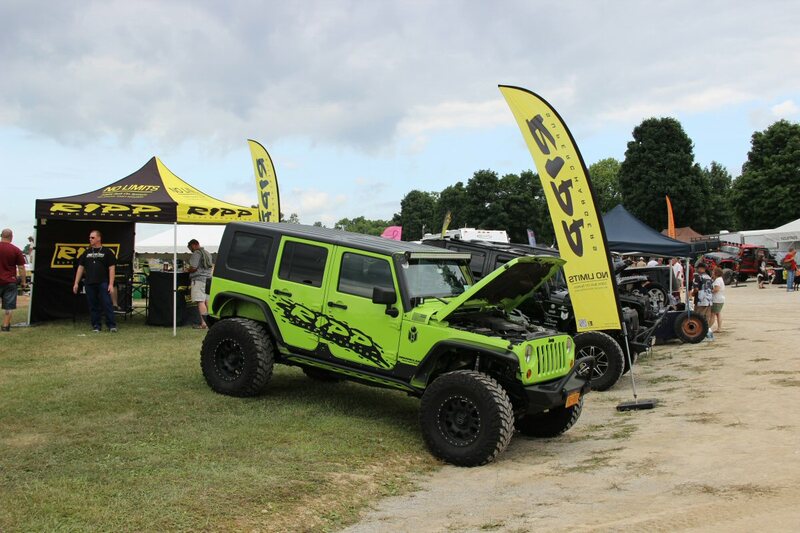 The swing out tire carrier is fabricated as a single-piece, high strength heavy gauge 2″ OD tubular design, and swings on it’s own load bearing hinges completely separate from the factory door hinges. 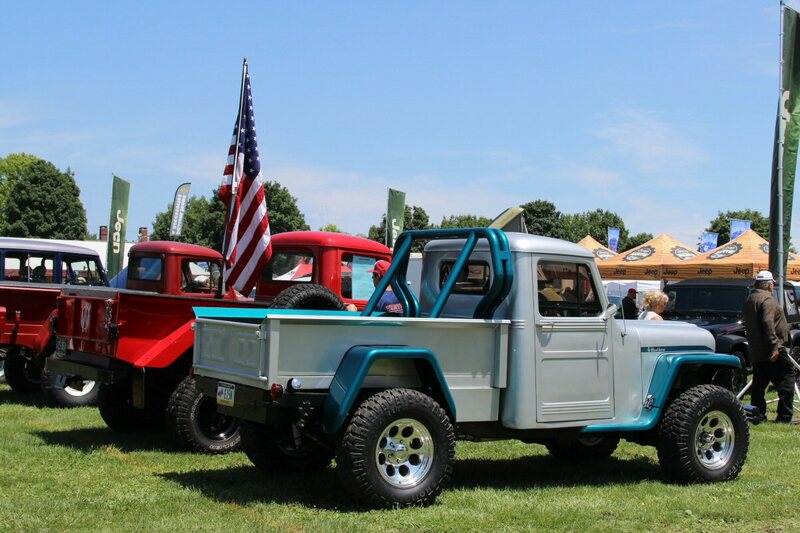 The tire carrier synchronizes with the tailgates motion using an integrated pre-tensioned tie rod mechanism that achieves rattle and vibration free operation. 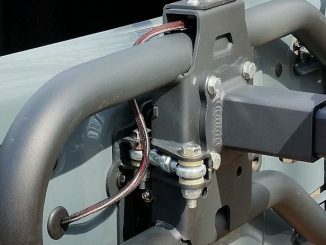 The tire carrier hinges use wide hinge bearing points for better stability and load distribution while providing an effortless door opening thanks to low friction self-lubricating bronze bearings. The tire carrier and door come to a stop through an integrated clearance to stock hinge design preventing an over extended open door and contact with the passenger side taillight. 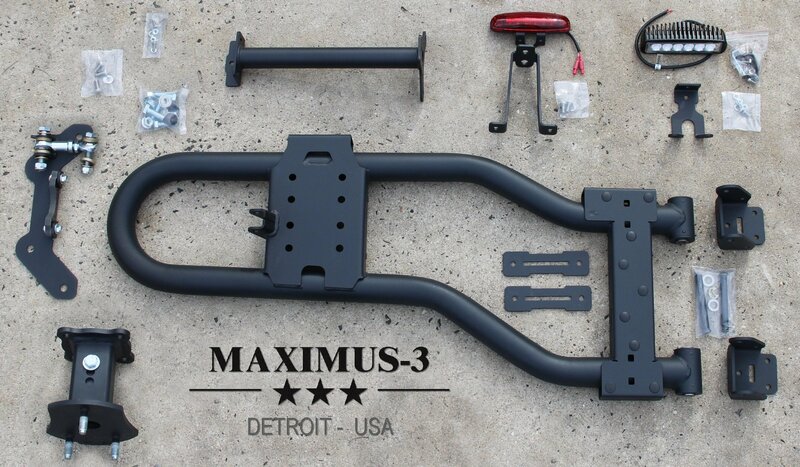 The Maximus-3 design fits up to 40-inch tire size load capacity and does not require the removal of the right rear tow hook loop. The spare tire is stabilized with multiple contact to rubber locations and the mounting location is low, centered and adjustable for various tire sizes and a low center of weight and optimal rear visibility. Finished in a durable fine textured black powder coat, the complete system weighs in at about 45 lbs. While this list is a general checklist for specific tools types that will be needed for this job, there were many more general tools that came in handy so have your toolbox ready. 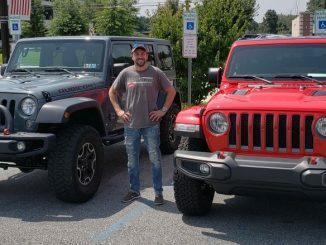 After a full inventory of our parts and gathering the tools we would need, we set out one Saturday morning to install the Maximus-3 JK Modular Tire Carrier. 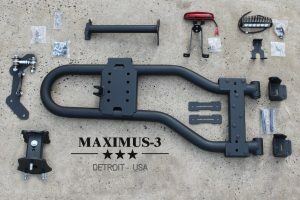 Maximus-3 provided a thorough, accurate set of instructions for Modular Tire Carrier as well as supplemental instructions for their optional components including the Backup LED Light we ordered. The tools we would need for this job were minimal and common and included a metric socket set, metric open wrench set, a set of metric Allen Keys, a Torx Socket Bit #50 and an L-shaped Torx key #50. We used several other tools as well but mainly for aspects of the project outside of the standard installation. 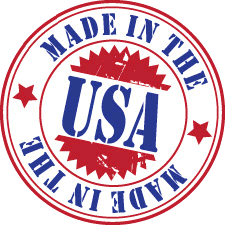 The following is our step-by-step account of the installation. 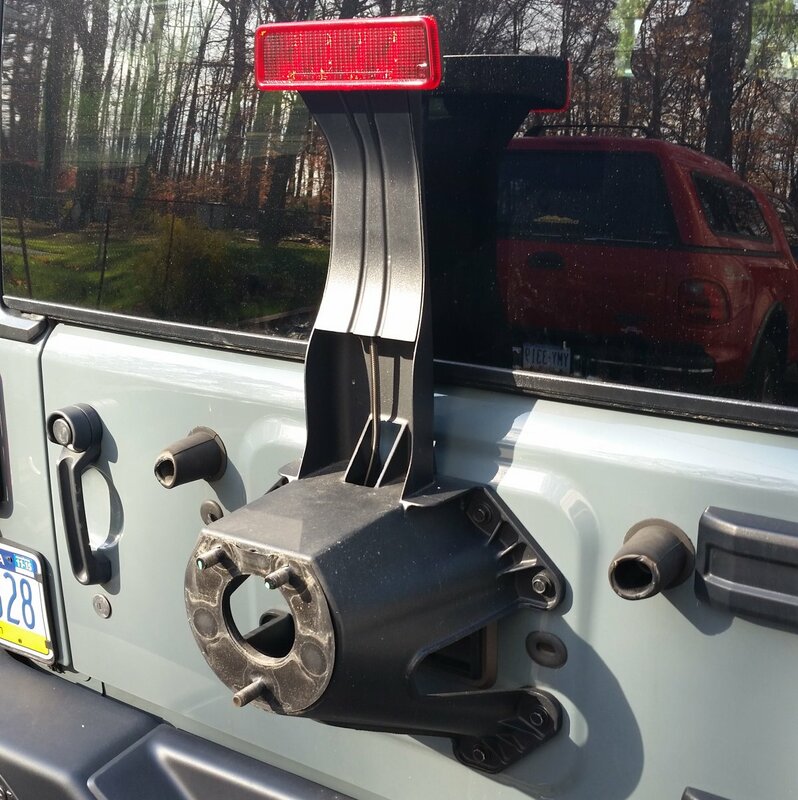 This is the stock Jeep JK tire carrier. We will be removing this weak stock component and replacing it with a heavy duty Maximus-3 Spare Tire Carrier. 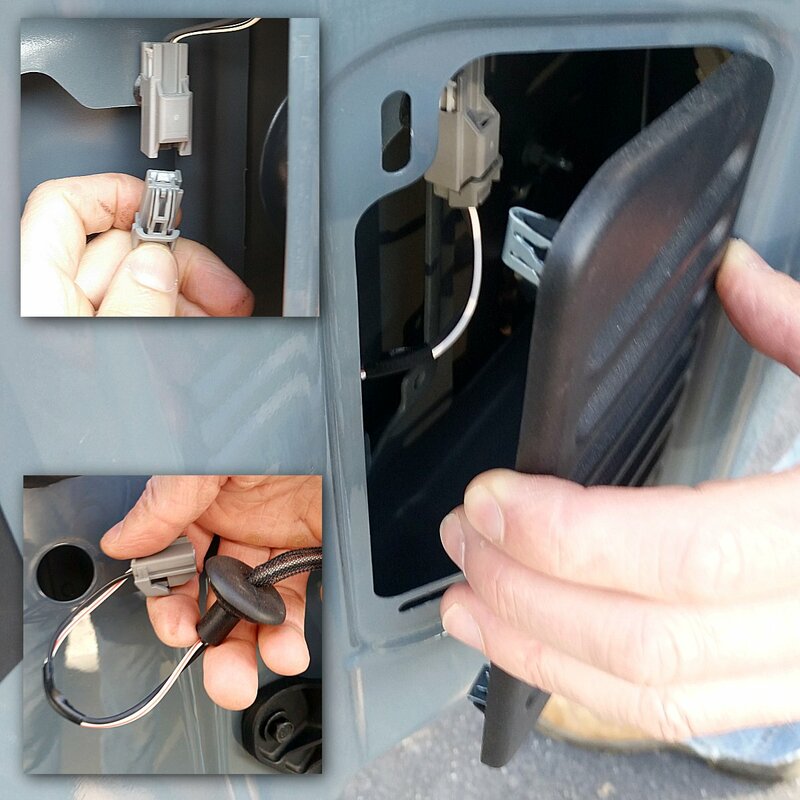 Before removing the tire carrier, we need to disconnect the 3rd brake light wiring harness located inside the rear door. 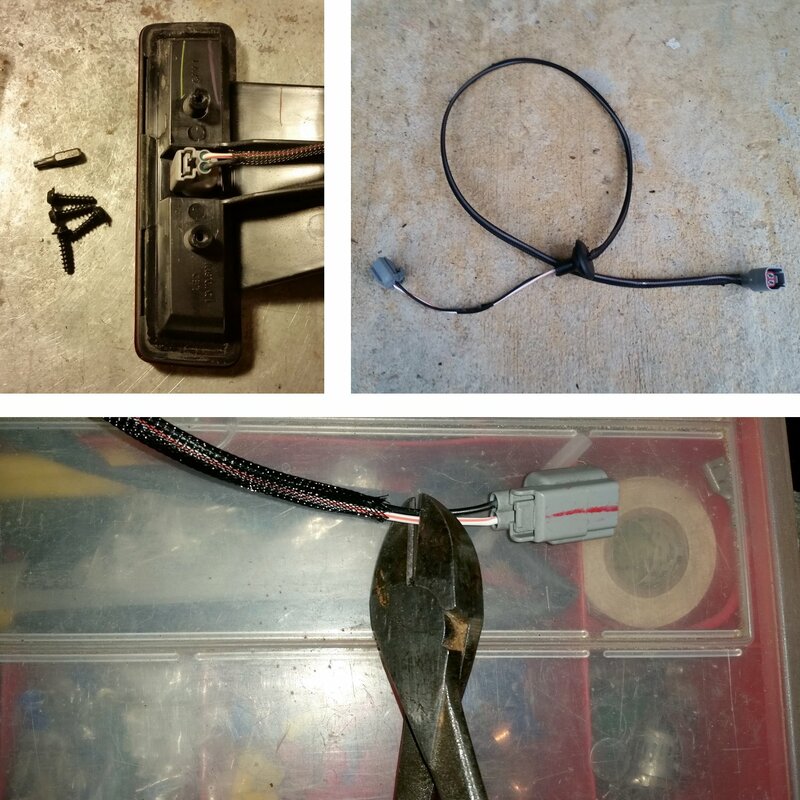 To gain access to the 3rd brake light wiring harness remove the vent cover using a pry tool. Pop the cover straight off on it’s left side. Disconnect the harness, pop out the rubber grommet and feed it out through the door. 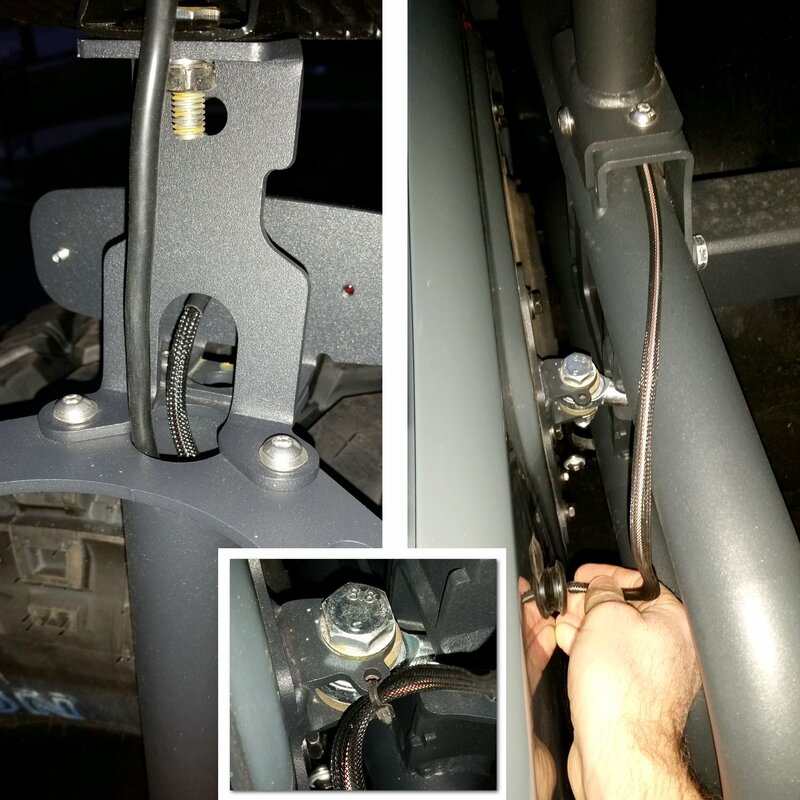 Using a 13mm drive socket remove the 8 bolts that hold the stock tire carrier to the door. Re-install four of these bolts back onto the door on the passenger side. Save the remaining 4 for later when the Tie Rod Linkage Plate is installed. Be sure to remove the rubber grommet and wiring harness from the door. Later we will remove and reuse the stock 3rd brake light wire harness. 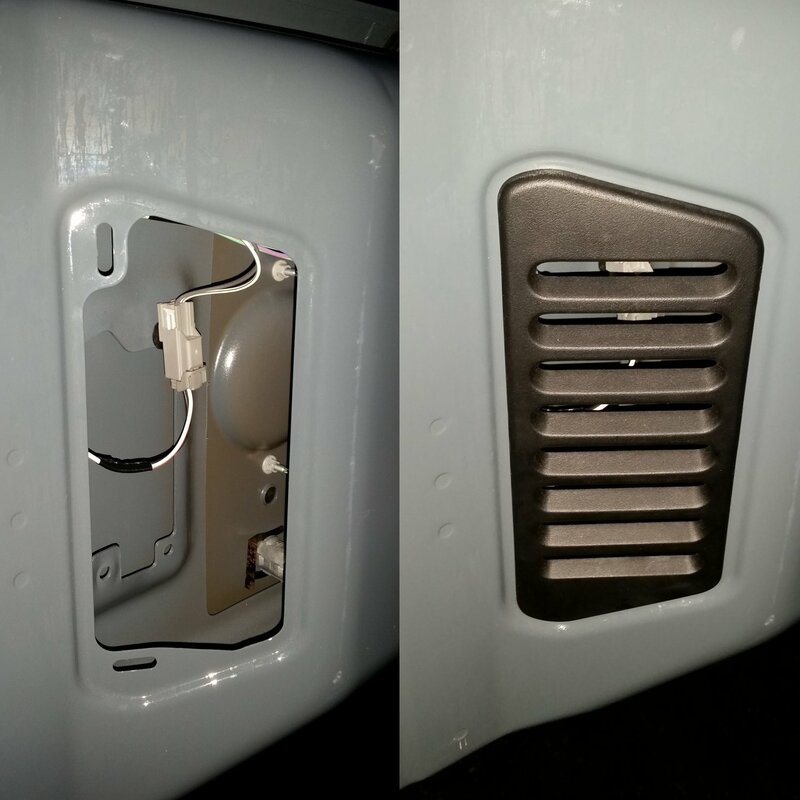 Remove the plastic door hinge covers and the rubber tire bumpers. Plug the tire bumper holes with the grommet plugs provided in the Maximus-3 kit. 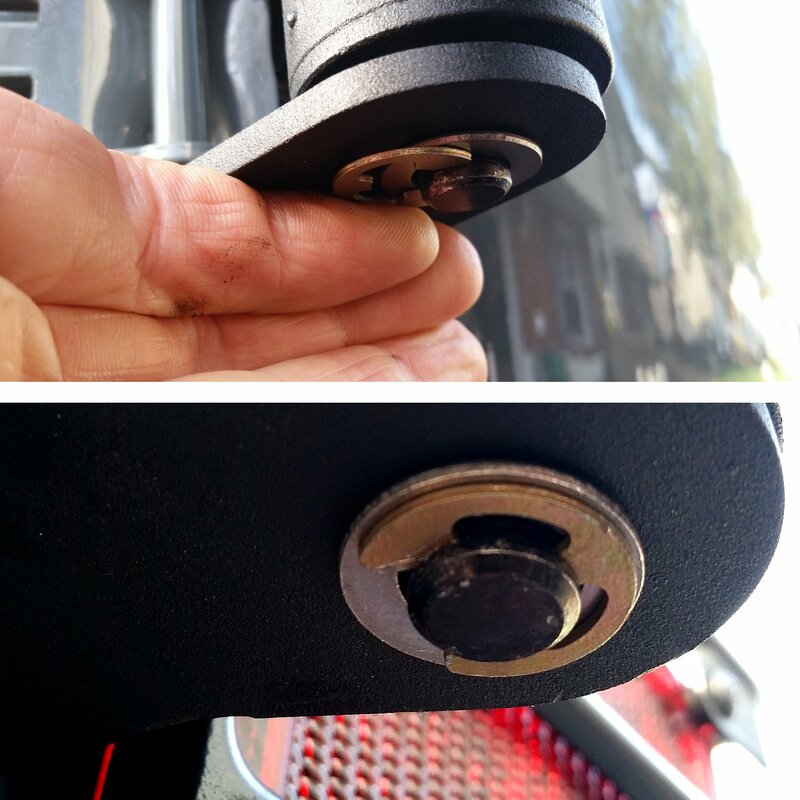 Our grommet plugs seemed a little loose so we used clear silicone to secure them to the door and seal out the weather and mud. Starting with the top hinge, remove the two 13mm hinge bolts that hold the hinge to the door. When we swung the hinge open to access the 3 outer torx bolts to our surprise we discovered rust beind the hinge! 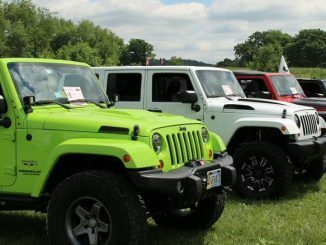 No way we are going to tolerate rust on our new 2014 JK. 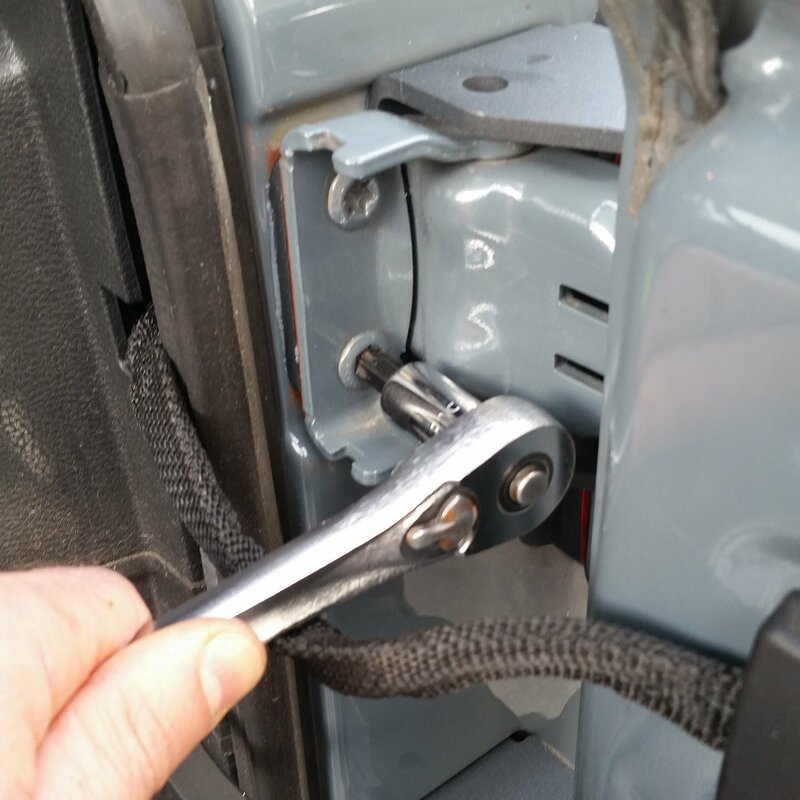 As part of the next step in the installation keep the door closed and swing the hinge open to access the 3 outer torx bolts and remove them. 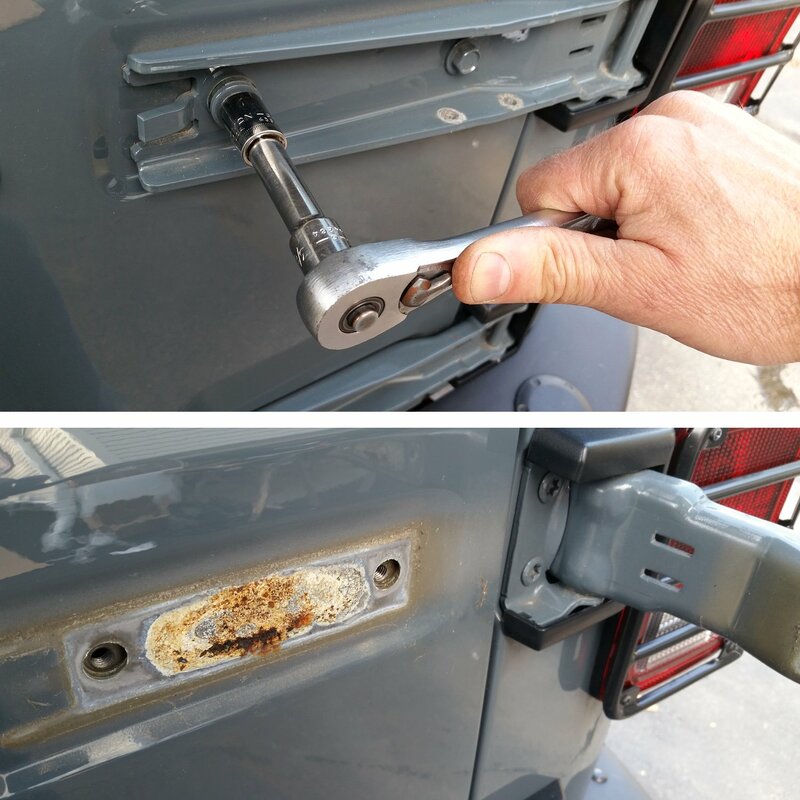 We removed the hinge and immediately went into rust removal and prevention. The hinge and door got a careful wire wheel cleaning and a coat of rust primer. Ready for the next step. Here’s a tip that I’ve been doing for years on my weather exposed projects. Whenever I have metal on metal contact with painted surfaces, I add a layer of clear silicone in between. 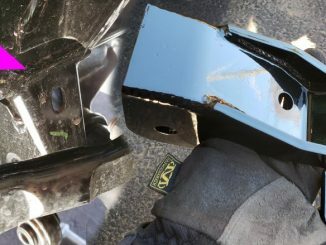 In this case the contact is between the body, the Tire Carrier Hinge Bracket and the hinge. Just before installation, I coat the contact surfaces with silicone, then install. This helps to keep moisture out and buffers the surfaces from digging into the paint thus helping to prevent rust. 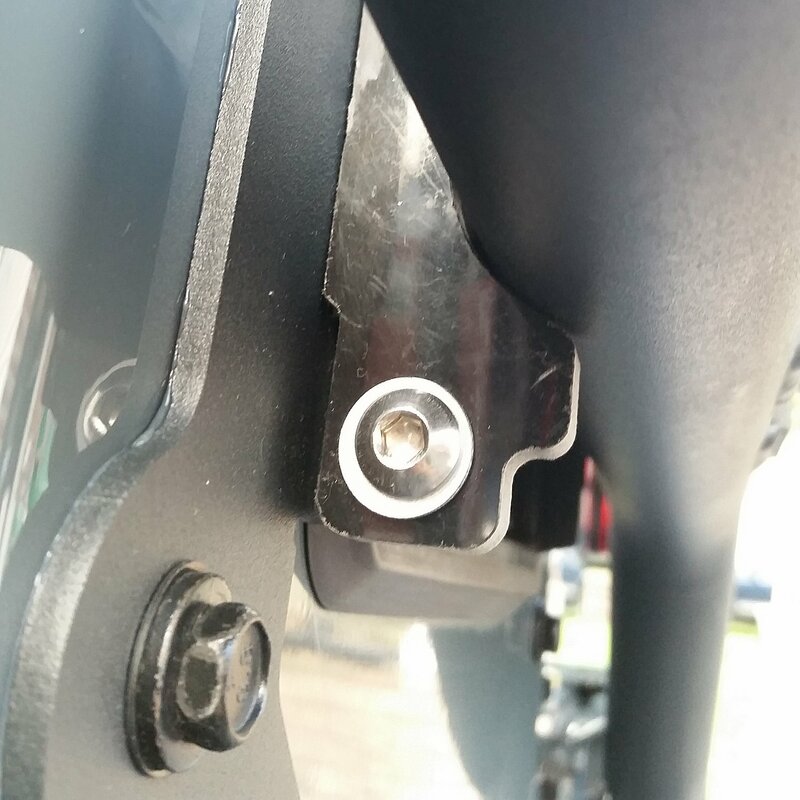 Slide one of the tailgate hinge into the Hinge Bracket, line up the holes and insert the three torx bolts. Put Locktite on all 3 of the bolt threads. 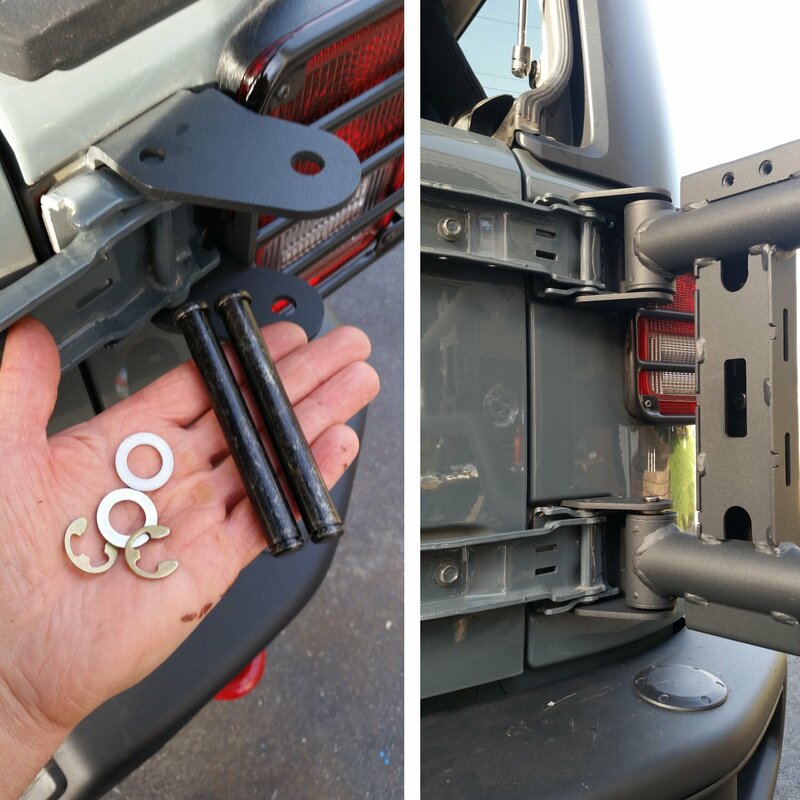 Now line up and install the tailgate hinge, hinge bracket and bolts back onto the Jeep. DO NOT tighten the bolts completely at this point , rather somewhat snug, because you will need some movement when adjusting the hinge pins later. Getting into the right-most torx may be difficult if your torx wrench is not angle tight enough. 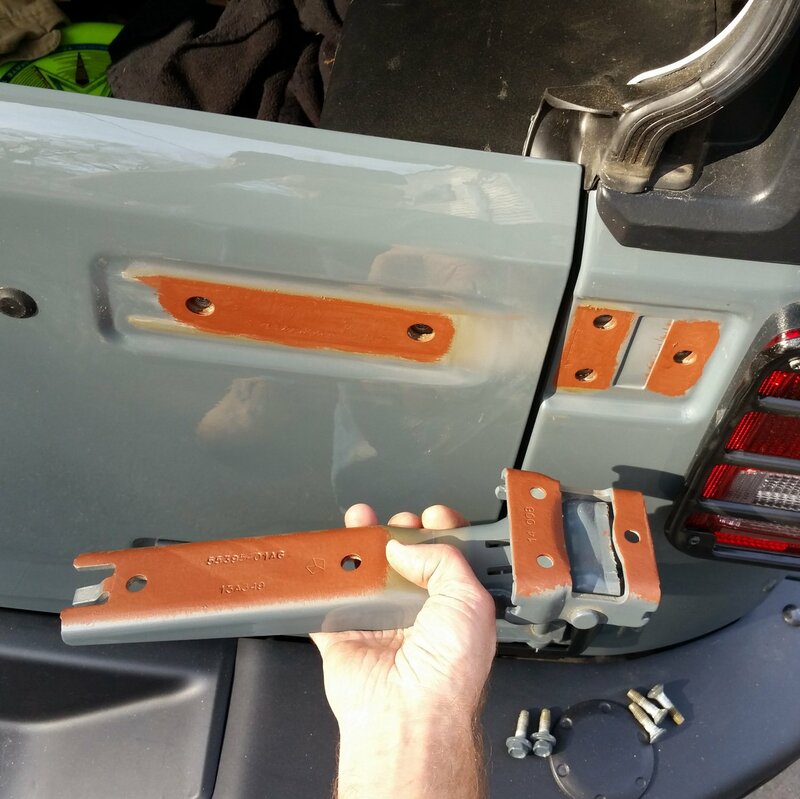 After installing the hinge & Hinge Bracket to the body, insert a spacer plate between the door and the hinge strap. Again we used a coat of clear silicone on the plate and hinge. Line up the holes and install the two torx bolts with ample Locktite on the threads. Fully tighten these two bolts. Repeat the same process with the lower hinge and hinge bracket. 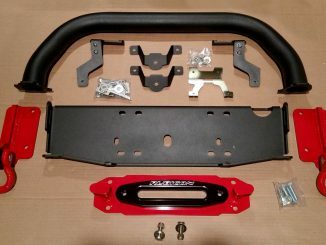 Time to install the Tire Carrier. 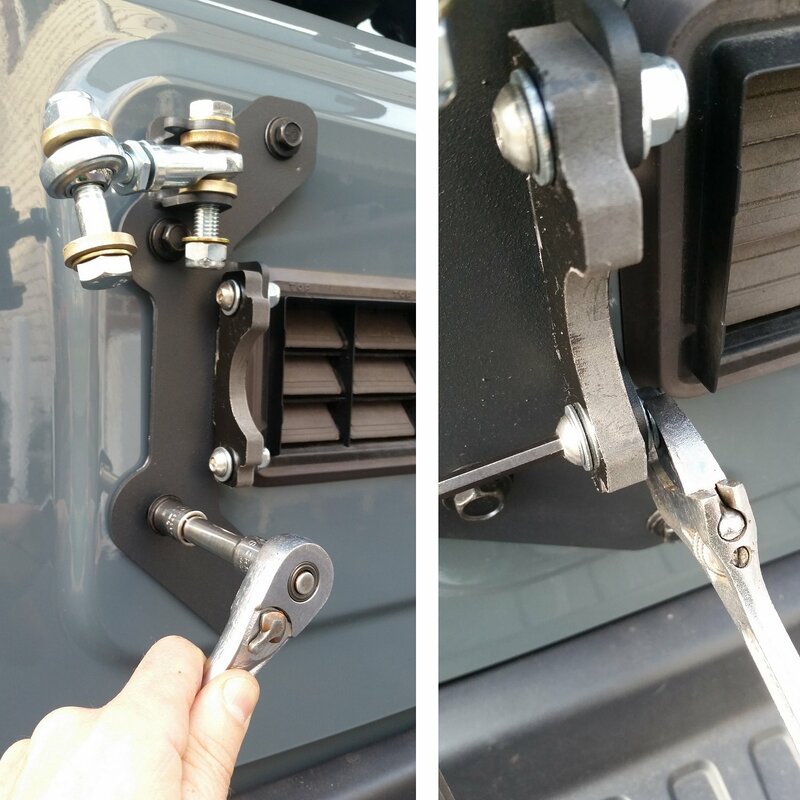 Grab the hinge pins and slide the tire carrier bushings into the Carrier Hinge Brackets. Line up the holes and push the hinge pins into through and out the bottom. 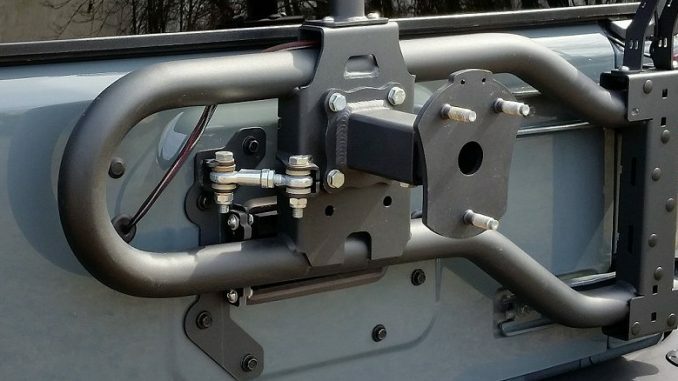 You may need to wiggle the Carrier Hinge Bracekts to line up the Bracket with the Bushings. 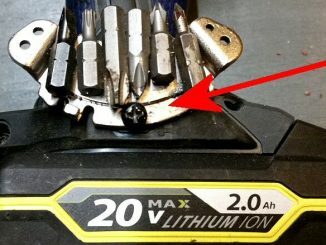 This is why the bolts were left somewhat loose. Add the 12mm Stainless Steel Washer at the bottom of the hinge pin next to the brackets. Install the bevel side down (sharper cut edge) so as to not scratch the powder-coated surface. Next slide the e-clips onto the bottom of the hinge pins. 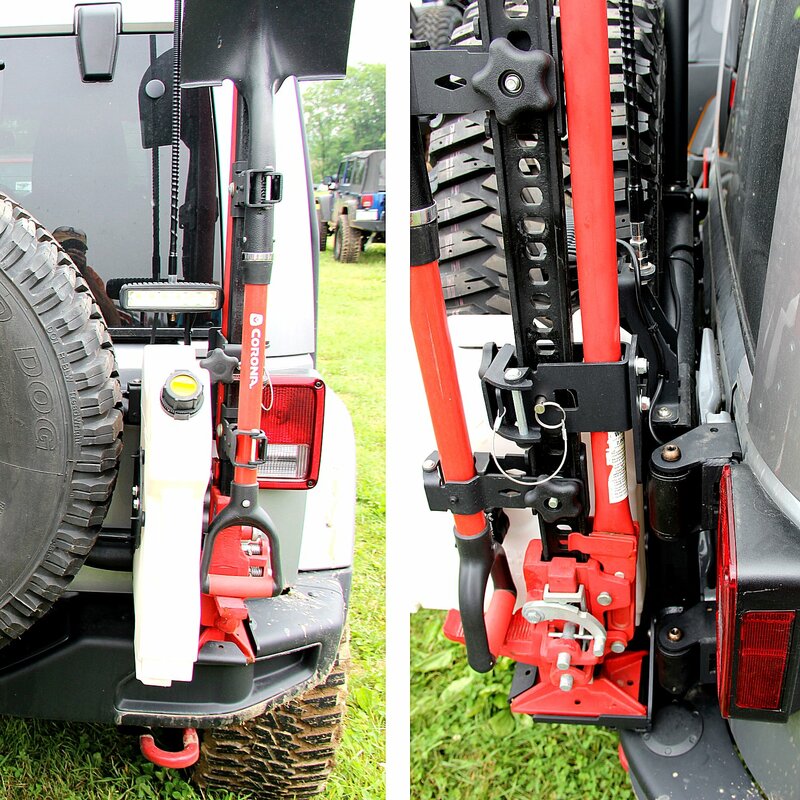 Swing the installed Tire Carrier fully open and closed and check for horizontal alignment in relation to the tailgate. 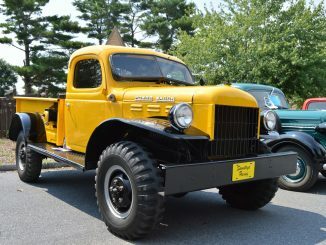 You may need to pull up a little on the end of the tire carrier to align it to the tailgate and correct any drooping. You’re going to need a tight angle L-shape Torx Key #50 to access those outer, right-most torx bolts with the tire carrier installed. 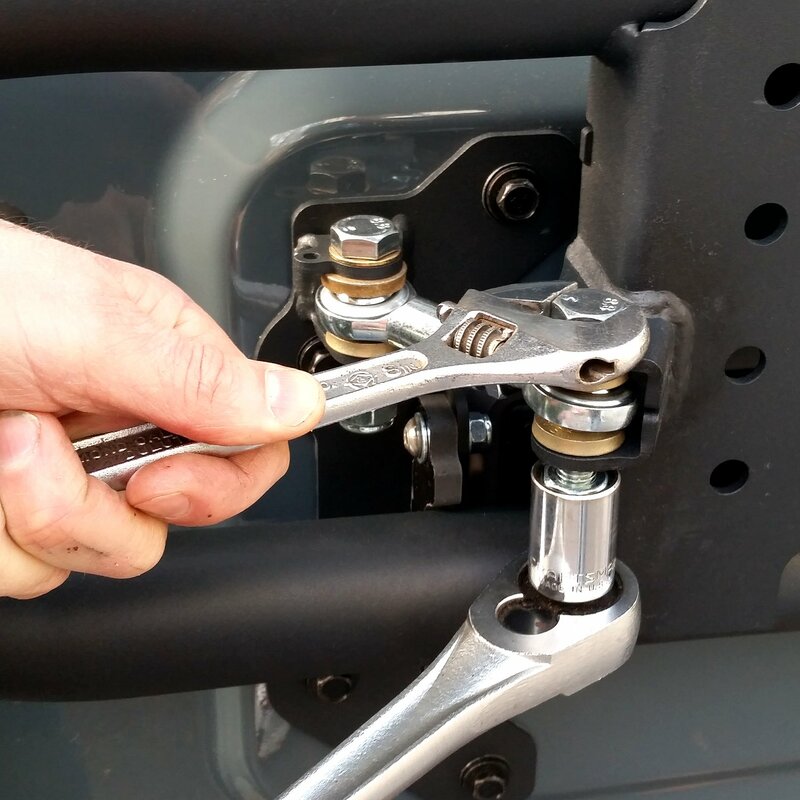 If you don’t have one (as we didn’t) it may be necessary to tighten those right-side bolts with the tire carrier off the brackets. We snugged up the torx bolts, installed the carrier and pressed the pins in and got it lined up, then removed the carrier and tightened the outer right-most torx bolts. Then we reinstalled the tire carrier and pins again. No problem. 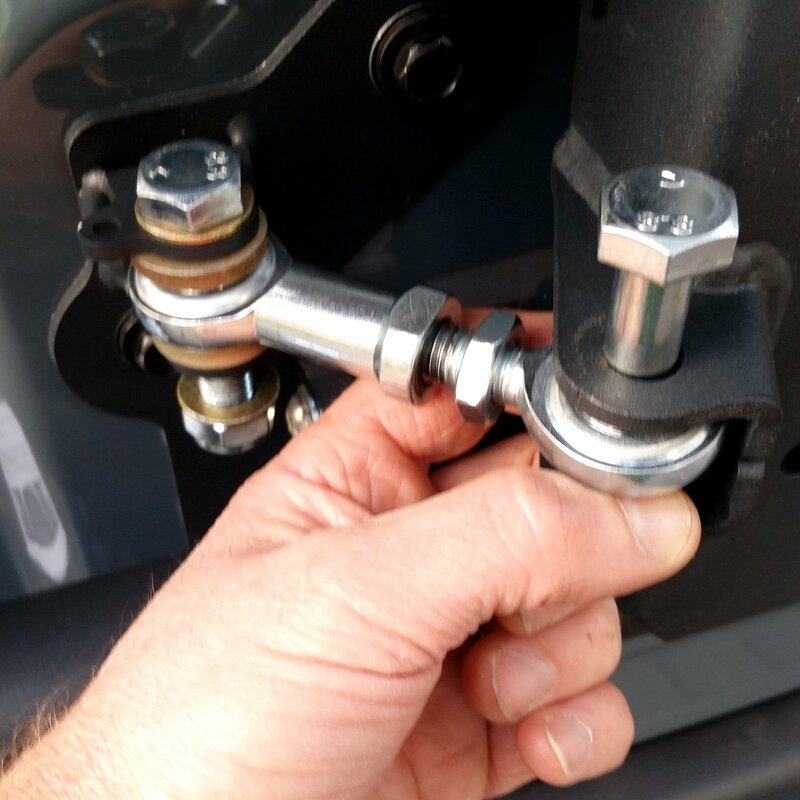 While pulling up on the tire carrier, we tighten the outer hinge torx bolts using an our torx socket bit #50. Next carefully swing the tire carrier and tailgate open to access the inner hinge torx bolts and tighten the remaining 4 bolts. Using those 4 factory bolts saved from the tire carrier line up and bolt on the Tie Rod Linkage Plate. Tight only snug for now as it may need adjustment later. 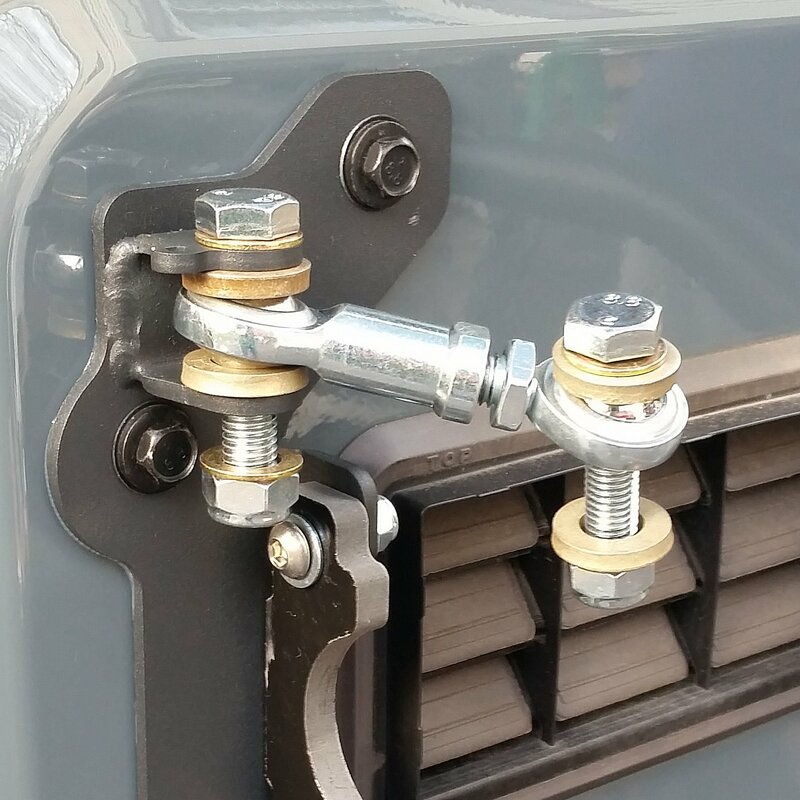 If not already installed on the plate, install the Nylon Stop Block using the 8mm Stainless Steel Bolts and flange nuts in the kit. Next with the tailgate closed swing the tire carrier into the Nylon Stop Block and adjust the height of the Nylon Stop Block so that it captures the tire carrier’s horizontal tube. Use the slotted holes in the bracket to adjust the Stop block vertically, then tighten the bolts that retain the Stop Block. 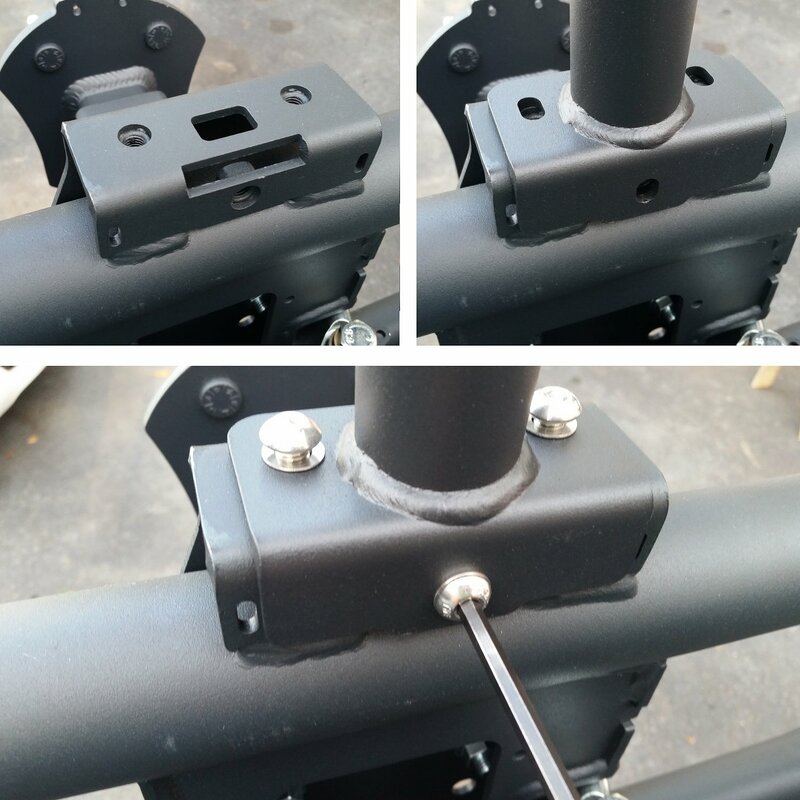 If more vertical adjustment is needed, you can adjust the Tie Rod Linkage Plate. When set, tighten the 4 Tie Rod Linkage Plate bolts. Next step in the instructions is to install the Tie Rod to the Tie Rod Linkage Plate. 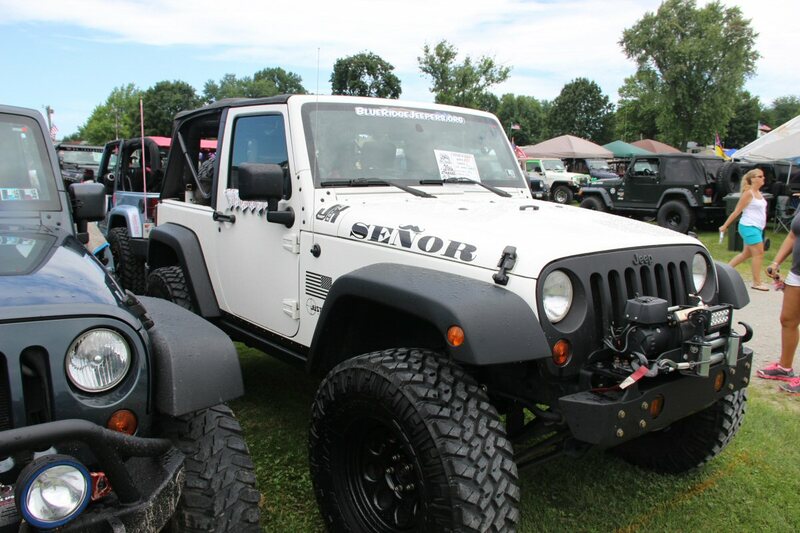 Our Tie Rod was already on the Plate and we never took it off but you may need to install it. For this you’ll use a 12mm bolt, washer, 2 spacers and lock nut from the kit. One spacer goes above and one below the Tie Rod eye. 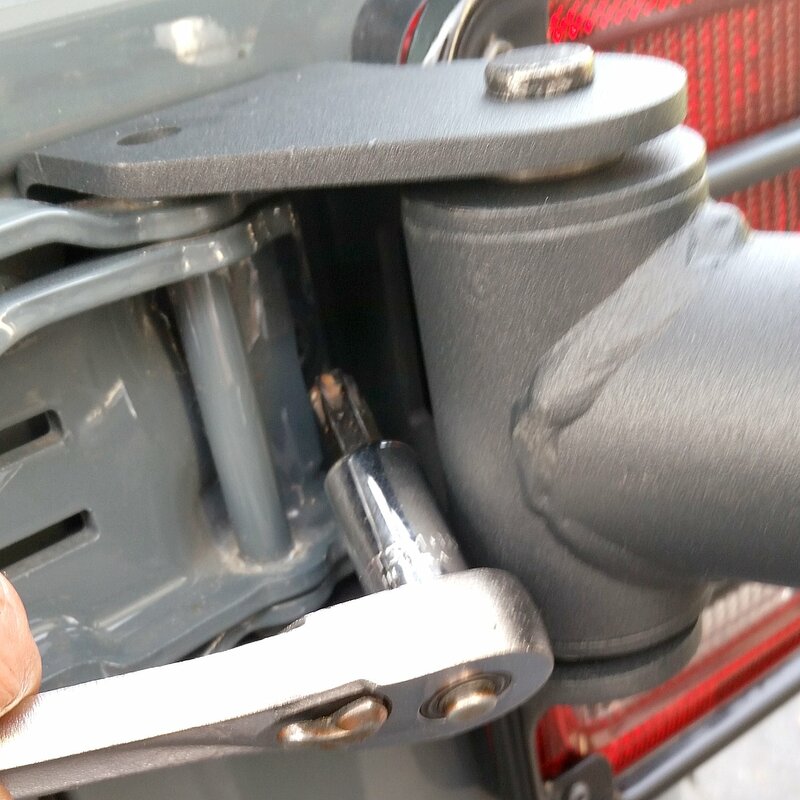 With the tailgate closed, push the carrier into the Nylon Stop Block and adjust the Tie Rod Length to line up the rod eye to the linkage channel tab on the Carrier. 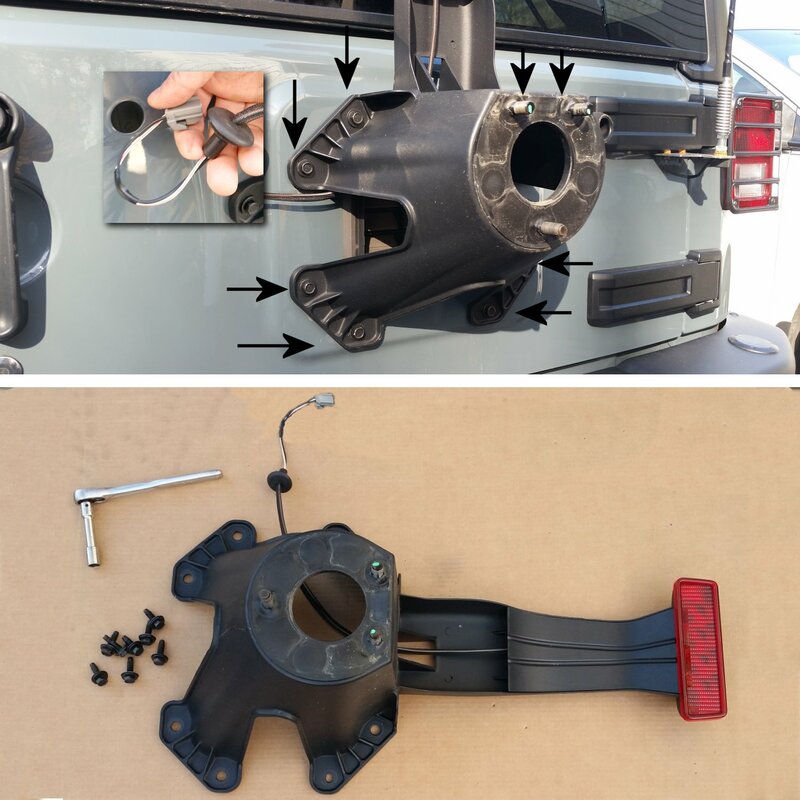 After setting the length, remove the bolt from the Carrier and reduce the length by 2 full turns to obtain a preload/tension setting to the Tire Carrier. 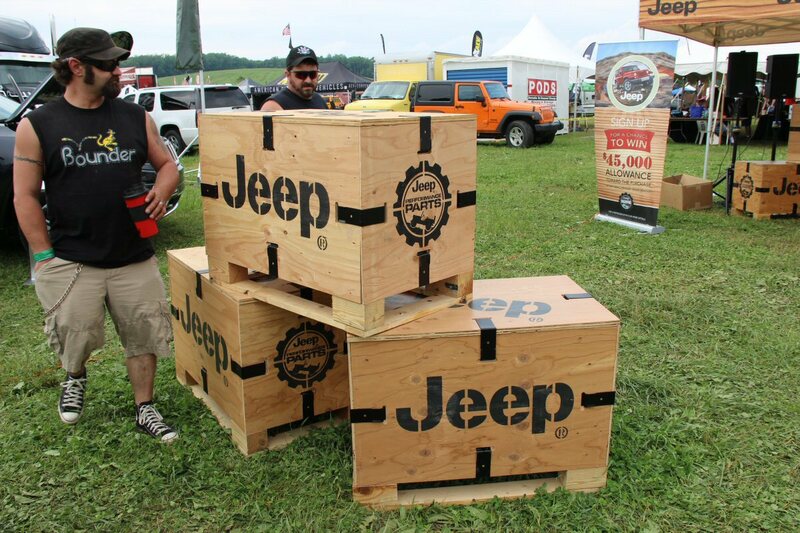 The preload will ensure a rattle-free, tight set of the Tire Carrier into the Nylon Stop Block. 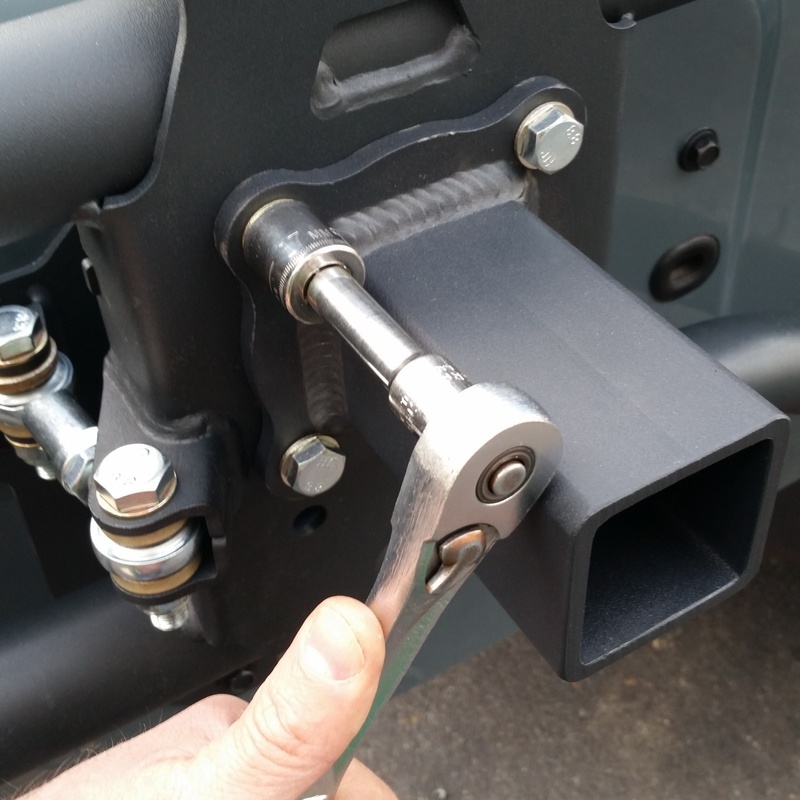 Now with the Tailgate slightly open, re-install the Tie Rod back onto the channel tab using the 12mm bolt, spacers above and below tie rod end, and the lock nut. Test operation of the tailgate and Tire Carrier. 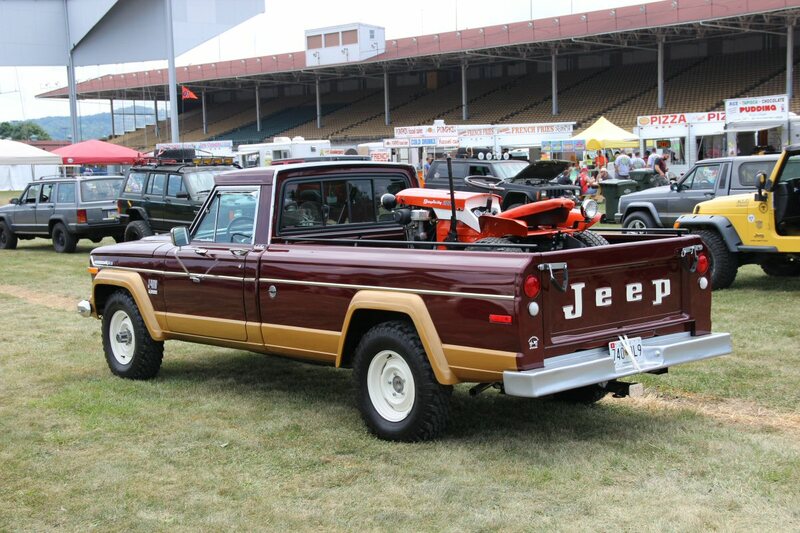 You should feel tension in the tailgate just before it closes. 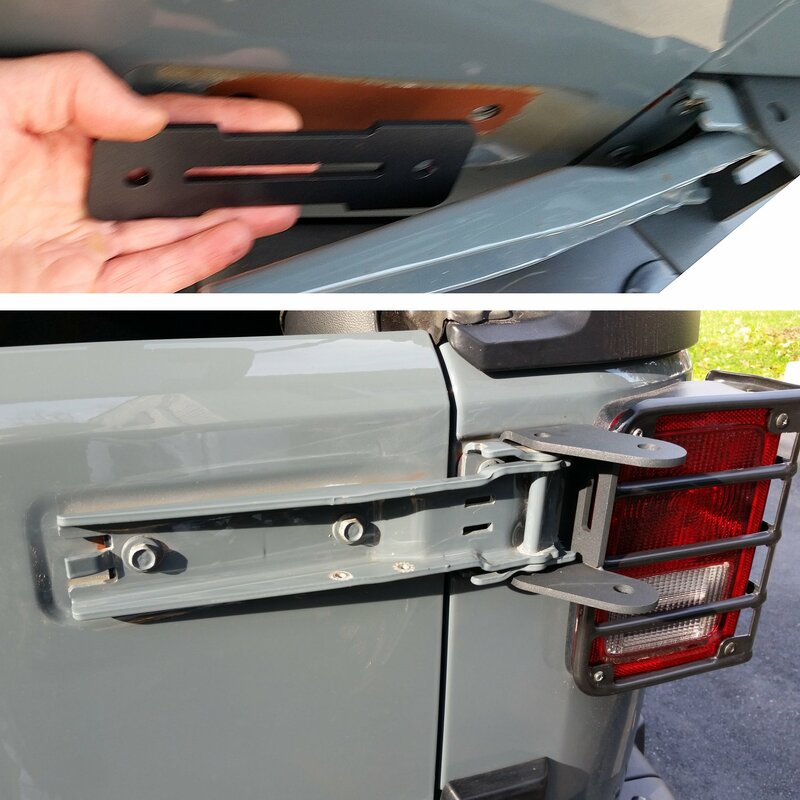 Now test the tailgates full range of motion by opening and closing as you normally would. While closed you’ll want to ensure the carrier is securely retained in the Nylon Stop Block by shaking the carrier. Re-adjust if necessary. 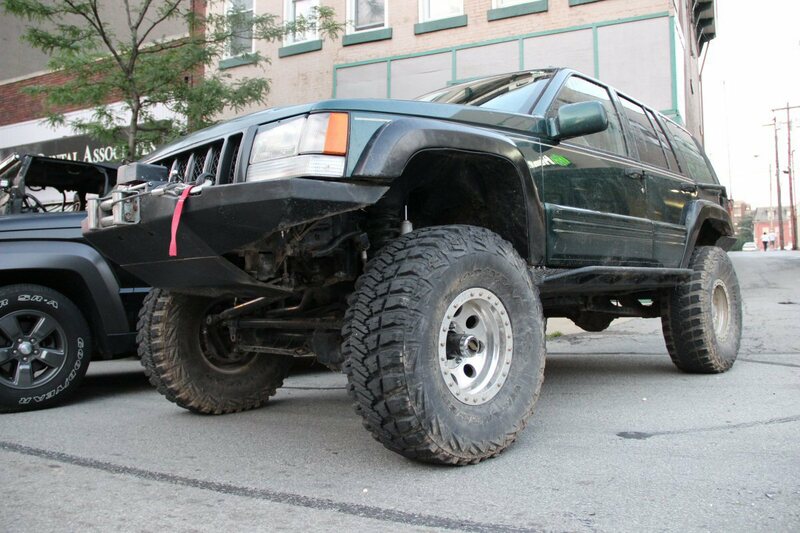 With the tailgate slightly open, tighten the Tie Rod bolt and lock nut at both the Tie Rod Linkage Plate and the channel tab on the Tire Carrier. Re-test the full range of motion from fully opened to fully closed. 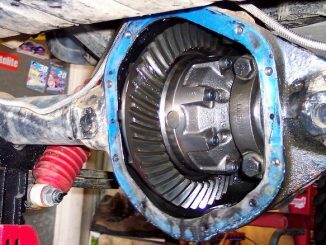 If it feels good, rattle-free and tight (but not overly tight, tighten the lock nut on the tie rod eye. Adjustment of our carrier to door was perfect with a tight, rattle-free close and great synchronized opening of the carrier with the door all the way to fully open. 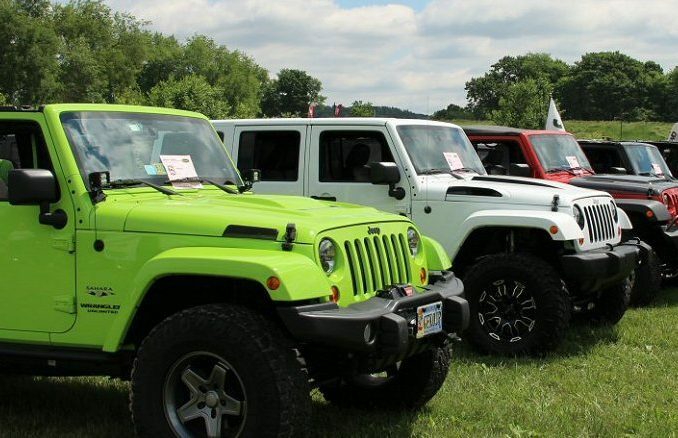 Now step back and admire for a moment. 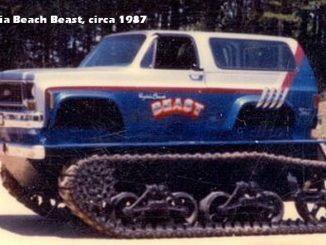 At this point we had to stop and admire the engineering of this tire carrier. Without a tire on the carrier it was easy to see the design and mechanics of the carrier. 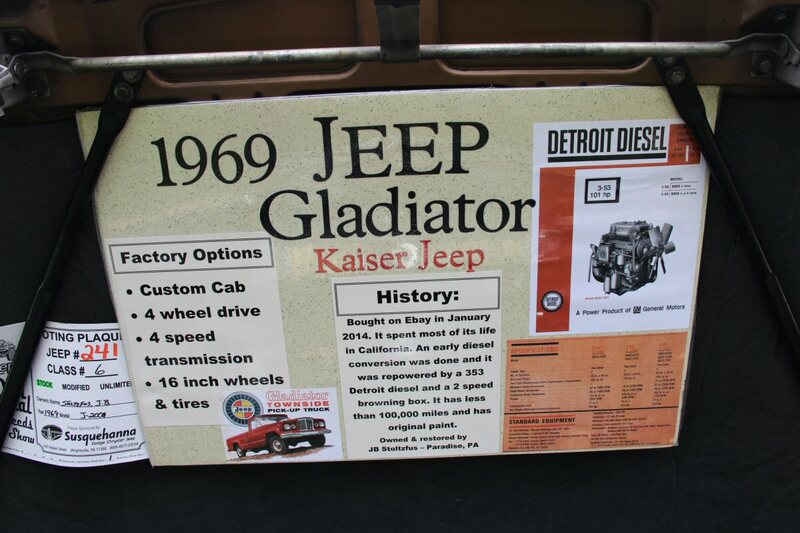 All of the weight of the tire is fully off of the door and transferred to the body but through the heavy duty tie rod, opening and closing of the door is very much the same as it was. 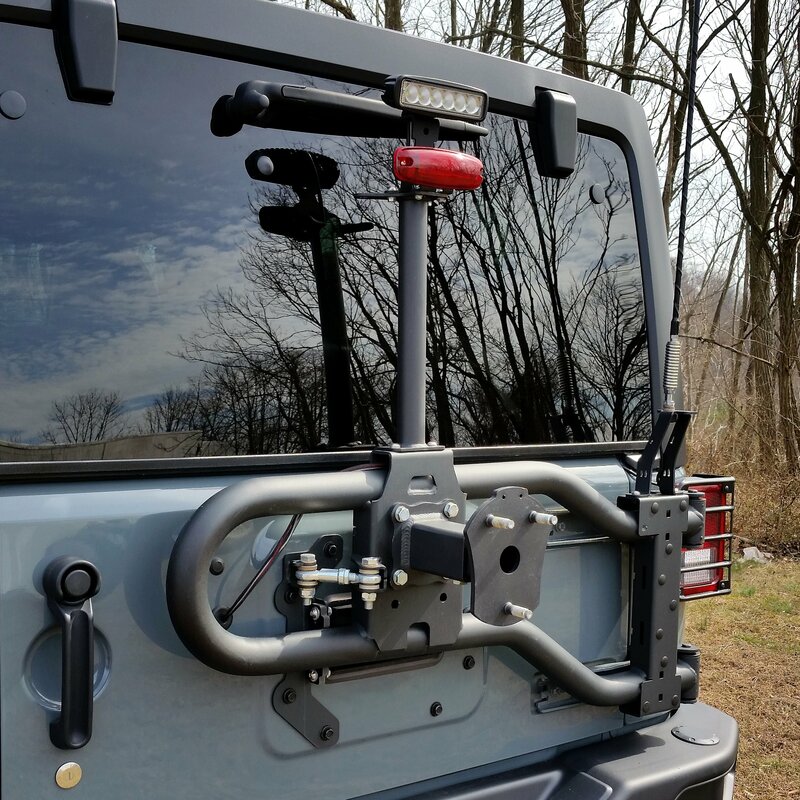 The Spare Tire/Wheel Mount is adjustable in depth with 3 mounting holes to accommodate a variety of tire and wheel sizes. 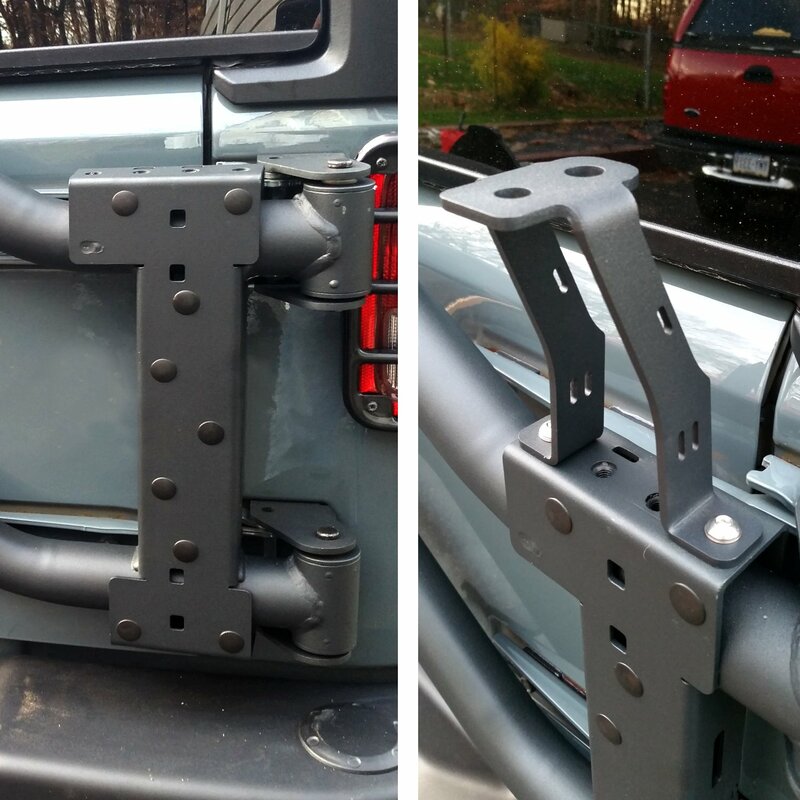 The Tire Carrier itself has 2 mounting locations (upper and lower) to adjust the mounting height of the spare tire. The first step in this process is to determine your mounting height. 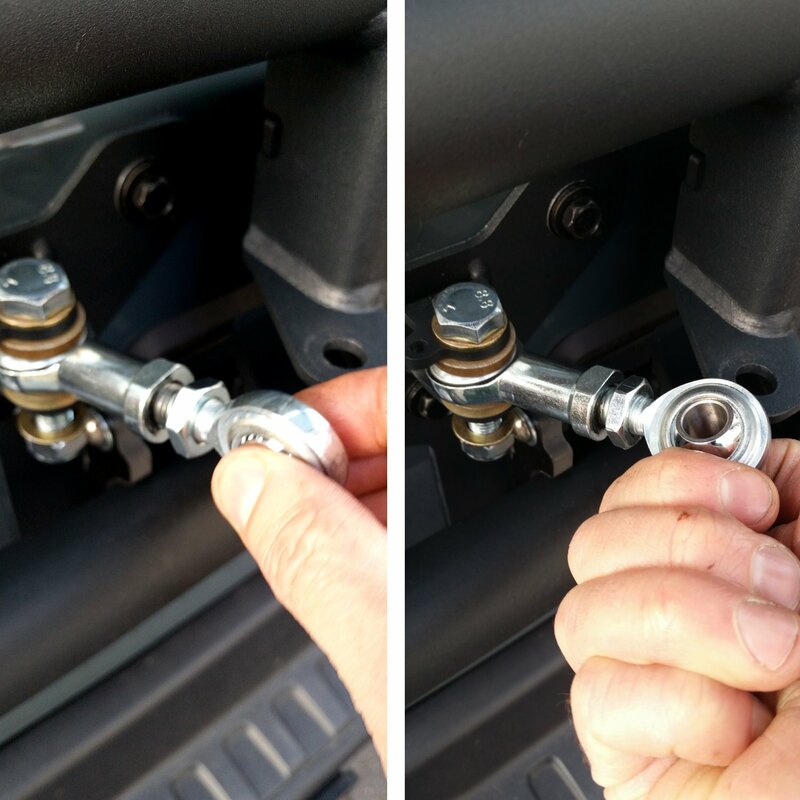 Separate the Tire/Wheel Mount base from the tire mount by removing the 12mm bolt. 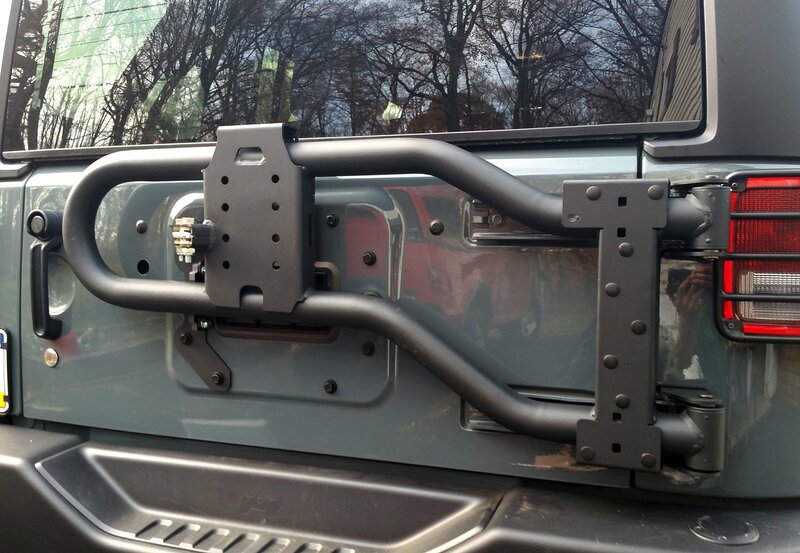 For our 35″ MTZ we started in the upper mounting holes but later determined we could use the lower holes and still clear the bumper so we moved it down for better visibility out of the rear window. Your requirements and preferences may vary. 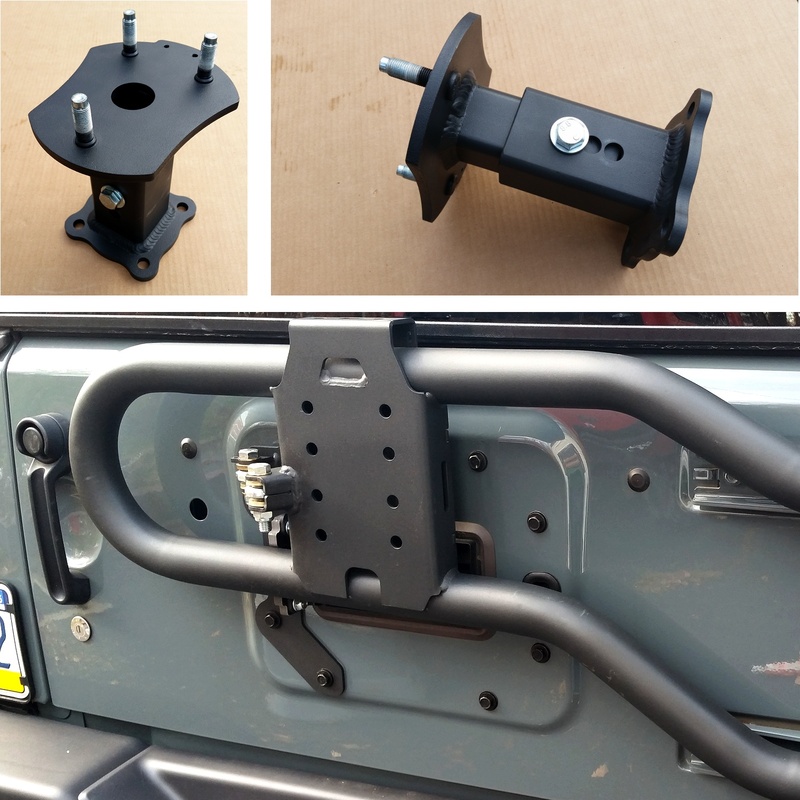 Using the 10mm bolts, washers and flange nuts, we bolted the Base Mount to the Carrier with the 3 holes facing down. be sure to use Locktite and tighten the bolts well. To determine the mounting depth of the Wheel Mount, you will need to measure the depth. 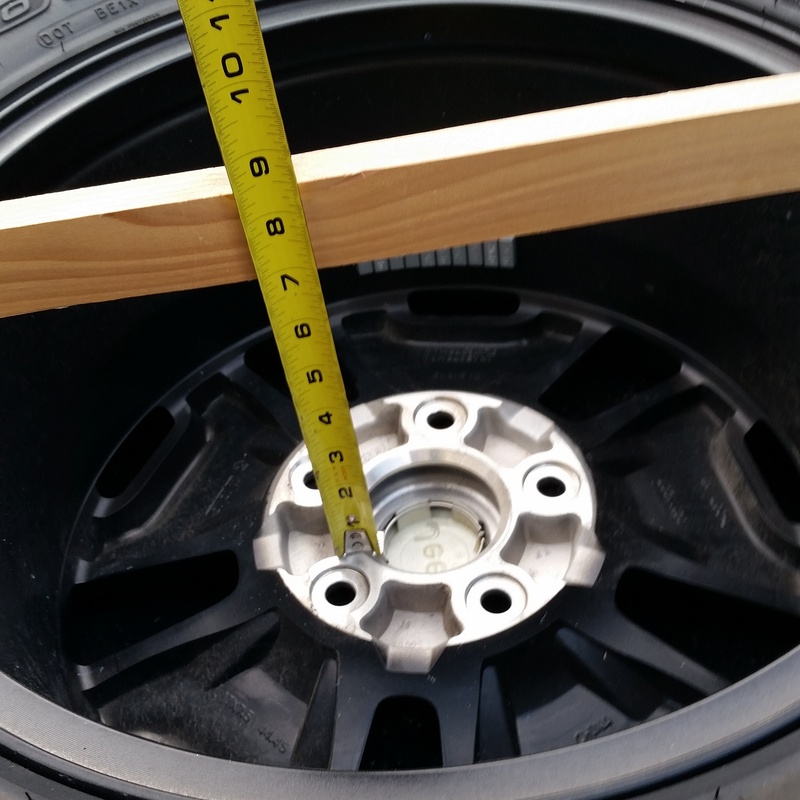 With the Spare wheel/tire upside down, use a tape measure and a long board to measure the distance from the face of the tire to the wheel hub mount surface. 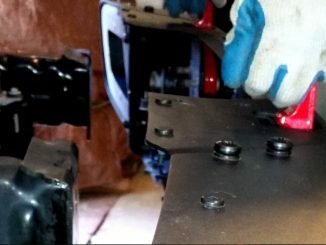 Install the Wheel Mount into the Base with the weld nut facing down and adjust the Wheel Mount depth so that the distance between the mount surface and the Carrier Tube is just shorter than the measured wheel/tire depth. 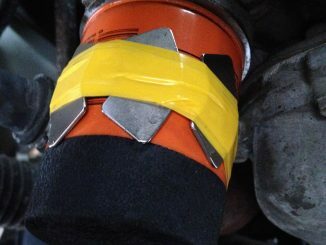 This will ensure that tire mounts tight and secure against the tire carrier. Line up the Wheel Mount weld nut with the nearest hole on the base mount just shorter than your measured distance. Using plenty of Locktite re-install the 12mm bolt and washer and torque to 45 lbs. Before mounting the spare tire, we need to install the Center Accessories Mast top center on the Maximus-3 Tire Carrier. The Mast will hold our 3rd brake light as well as our optional Backup LED Light. Designed to accept a multitude of accessories, the Maximus-3 Tire Carrier is engineered to make the installers job easy. 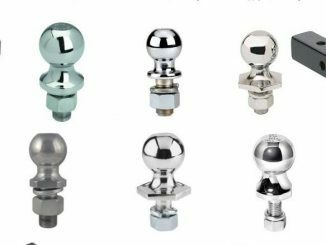 The Mast easily bolt right up to carrier using three supplied 8mm stainless steel bolts that thread into welded nuts within the carrier. When installing the nuts tighten the single front facing bolt first, followed by the two top side bolts. One accessory Maximus-3 offers that we really like is the Backup LED Light and a precision engineered bracket specifically designed to mount to the top of the Mast. 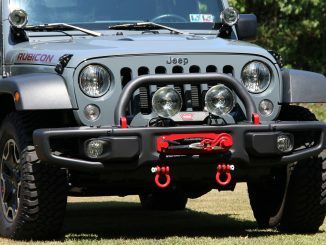 Maximus-3 offers a quick and easy way to wire the LED so that the light comes on when the Jeep is put into reverse. 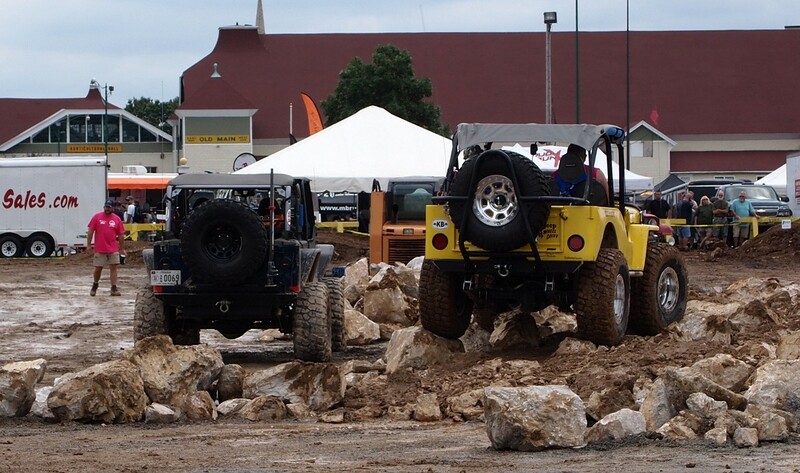 We really appreciate this feature considering many times offroad when we were backing up in the dark (especially that time we were blindly backing towards a 75-foot cliff in the dark). 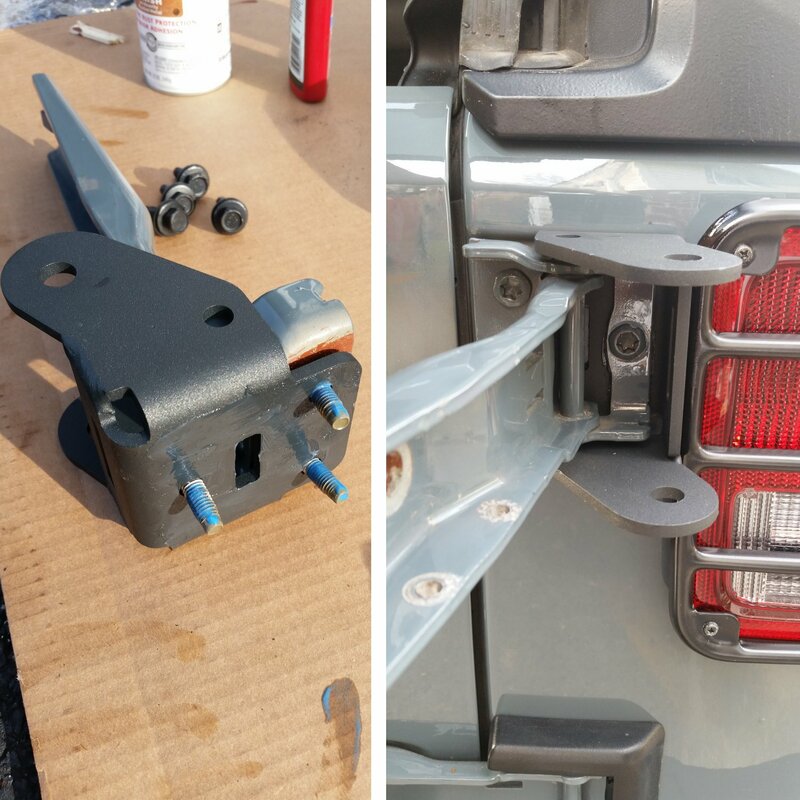 We mounted the Backup Light Bracket atop the mast, then installed the LED Backup Light and the included LED 3rd brake light. We will wire them up shortly. The Maximus-3 3rd Brake Light mounted atop the Mast will re-use the factory 3rd brake light wiring harness so we have to remove that from the original tire carrier. 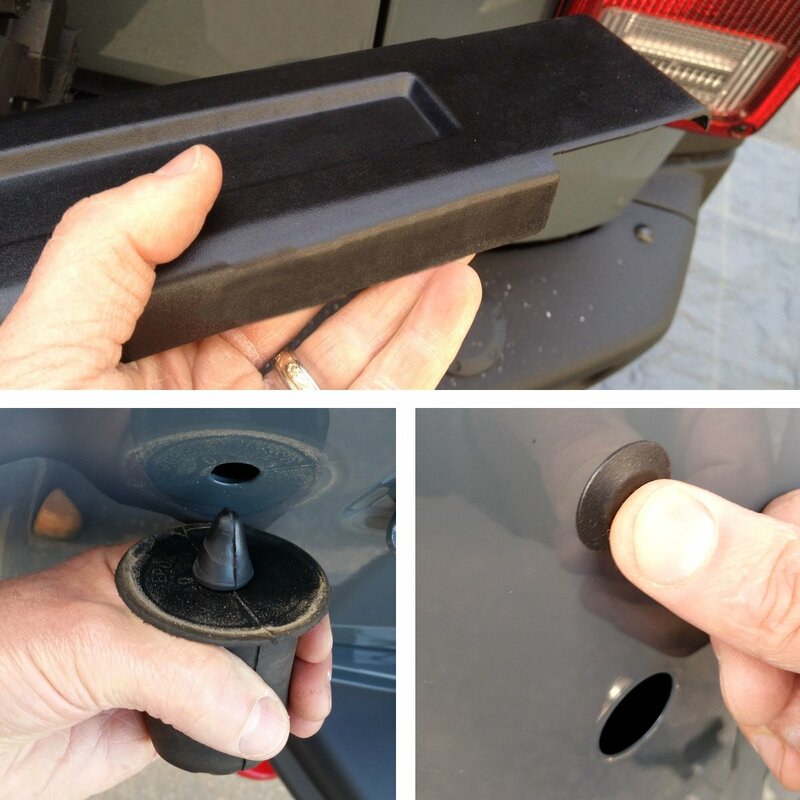 Using a T-20 Torx bit, remove the back cover from the tire carrier. 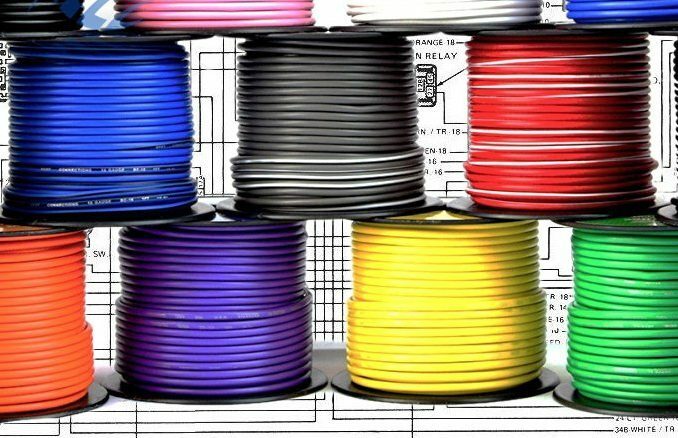 Unclip the factory wiring harness. The end that clips to the back of the original 3rd brake light (inside the cover you just took off) needs to be cut off. To preserve the future use of the cut end we cut off, we like to leave about an inch of wire on it. After cutting the end off the harness, strip back about 1/2 inch of insulation per wire. 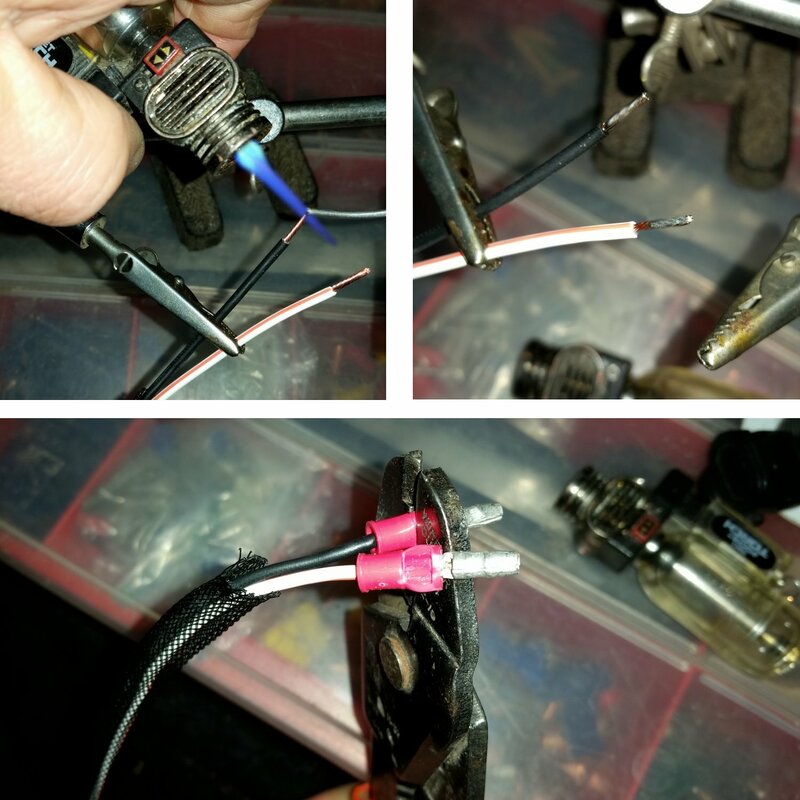 When splicing wires, we like to “tin” the wire with solder prior to crimping an end on. This makes for a tighter crimps that is very unlikely to get pulled out by accident. After tinning our ends we crimped on the bud connectors. Fish the 3rd brake light wiring harness bud end up through the center of the Center Accessories Mast. Connect the buds. The LED brake light’s RED wire connects to the factory harness white and red stripe wire. The LED white wire connects to the factory black wire. We like to wrap our connections with electrical tape to help seal the bud connectors and prevent them from pulling apart. Feed the wire harness down through the door then press the factory grommet back into the door. 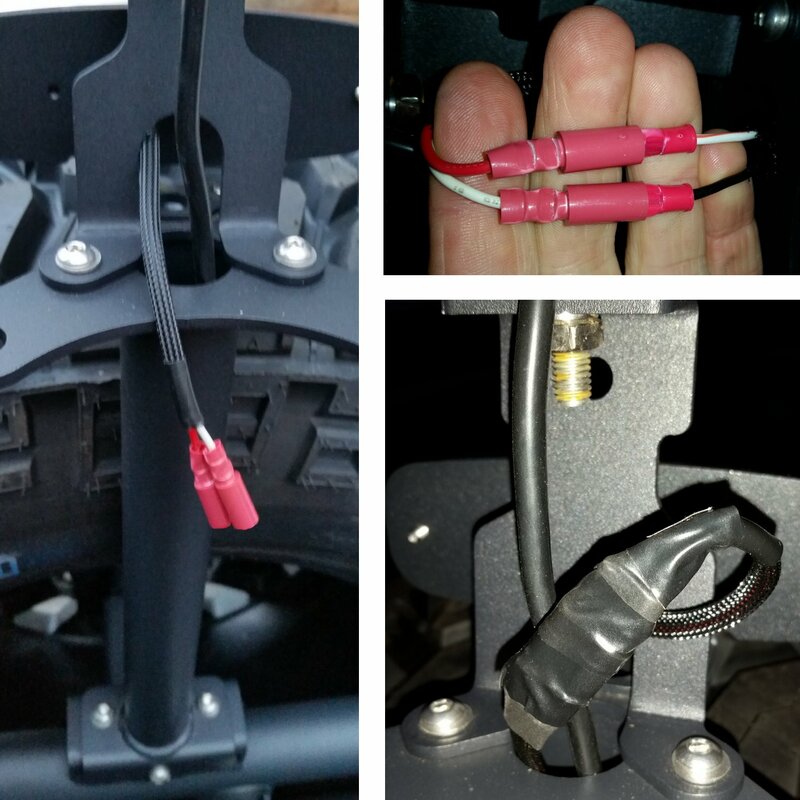 The Tie Rod Linkage plate has a zip tie loop hole to secure the 3rd brake light wire harness. Give the wire a little slack and secure it. Tuck the bud connectors down into the top of the Mast. Accessing from inside the door, reconnect the factory harness plug back onto the connector within the door, then re-install the vent cover. 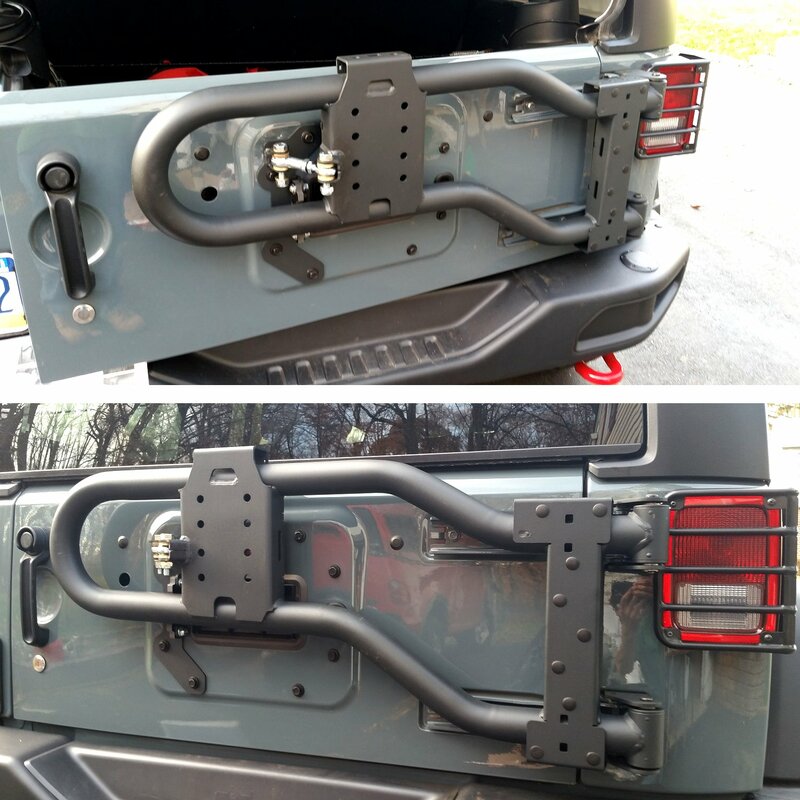 The Maximus-3 Tire Carrier has a great accessory mounting platform on the passenger side next to the hinges. This platform has numerous mounting locations for several useful Maximus-3 manufactured accessories including a Hi-Lift Jack Mount, a single and a double Rotopax Mount, a High Mount Work Light, and a Shovel Mount. 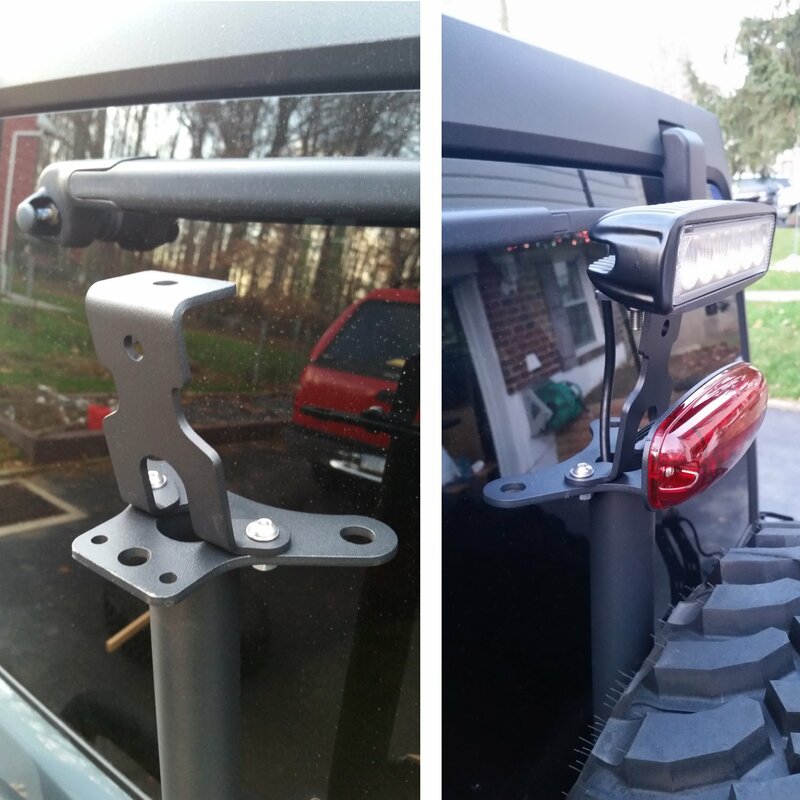 Our plans are to purchase the Hi-Lift Jack Mount in the near future but for now we wanted to get the High Mount Work Light bracket, which is a prime spot to mount our CB antenna along with another LED light. This second light will be wired to a switch we can flip when we need to flood the area behind the Jeep with light. Now Step back and admire your work…. After stepping back to have a full look at the finished product I believe “Wow” was the first word that came out of my mouth. From the black matte powder coated finish to the impressive engineering that went into the bolt-on design we couldn’t have been happier with the outcome. Fitment was perfect, exacting not just in dimensions but the appearance held true to our desire to maintain the Rubicon X look of style and sophistication. We love the strength of the entire package and especially like the manner in which the tire carrier secures tightly when the door is closed. 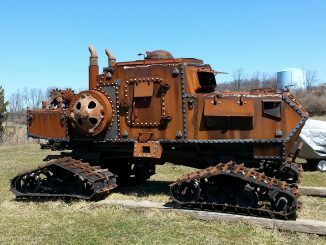 Absolutely no loose rattling anywhere. The entire installation only took a few hours of our time, half of which was photography for the install write-up. 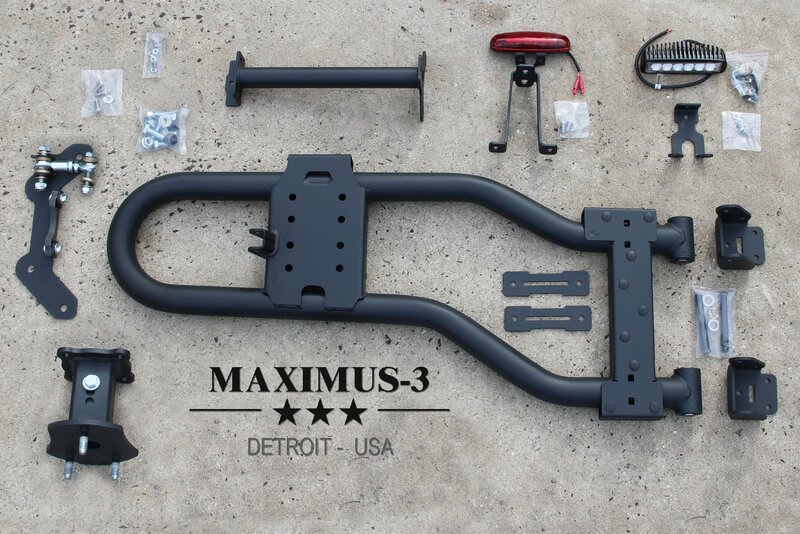 Anyone looking for a high quality, easily installed aftermarket tire carrier to replace the stock carrier, you seriously want to consider this package made by Maximus-3. 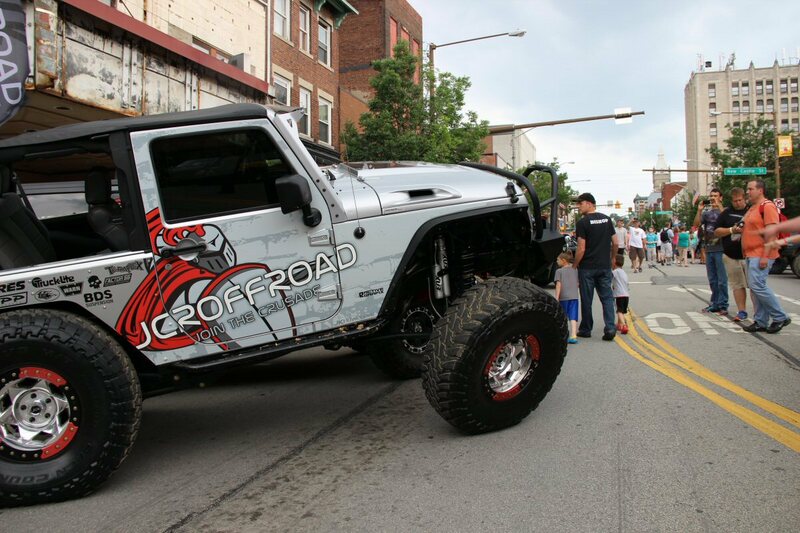 The only thing left was to mount our 35″ Mickey Thompson MTZ P3! 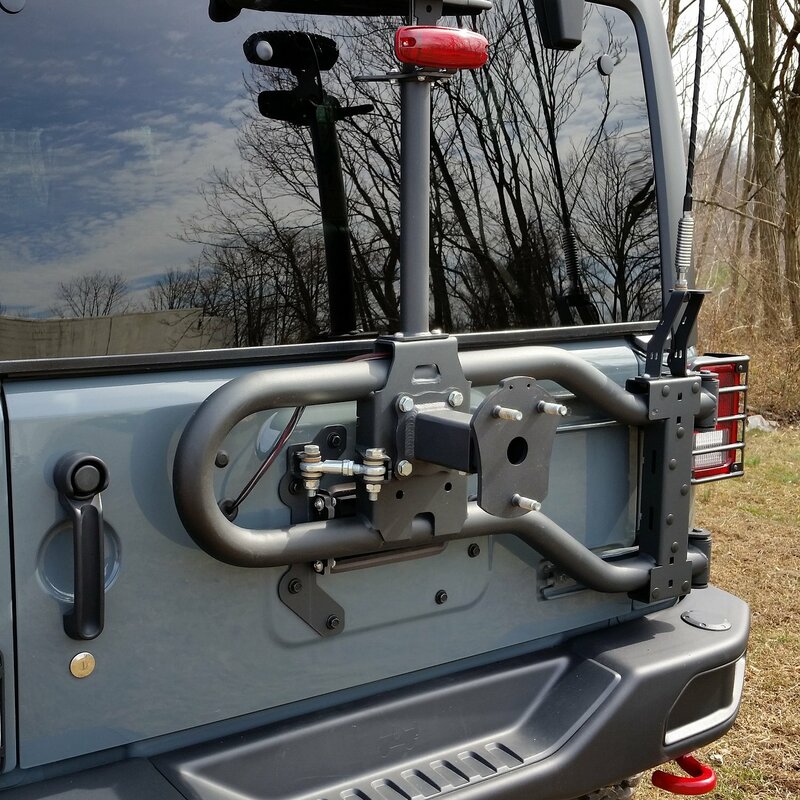 For more on our thoughts about this Maximus-3 Rear Tire Carrier, follow the link below to the full review. 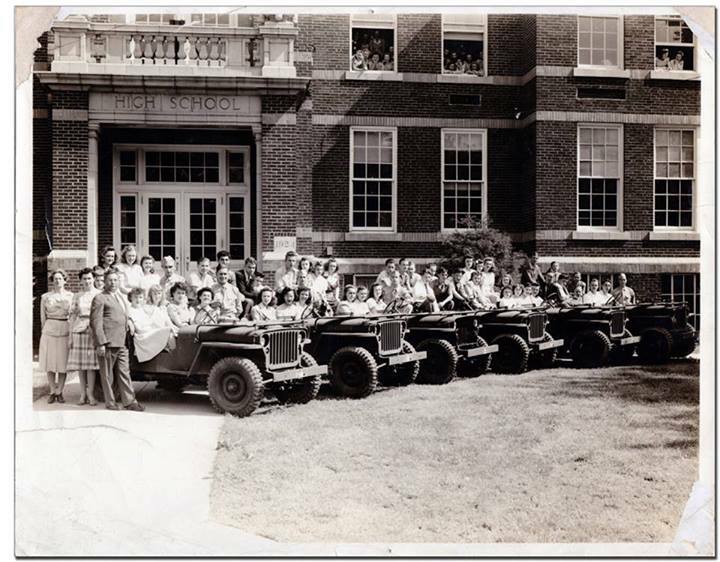 Happy Trails! 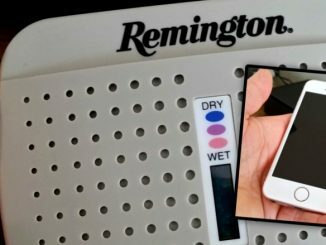 In our next segment we install and review the Maximus-3 Reverse LED light, just follow the link below. 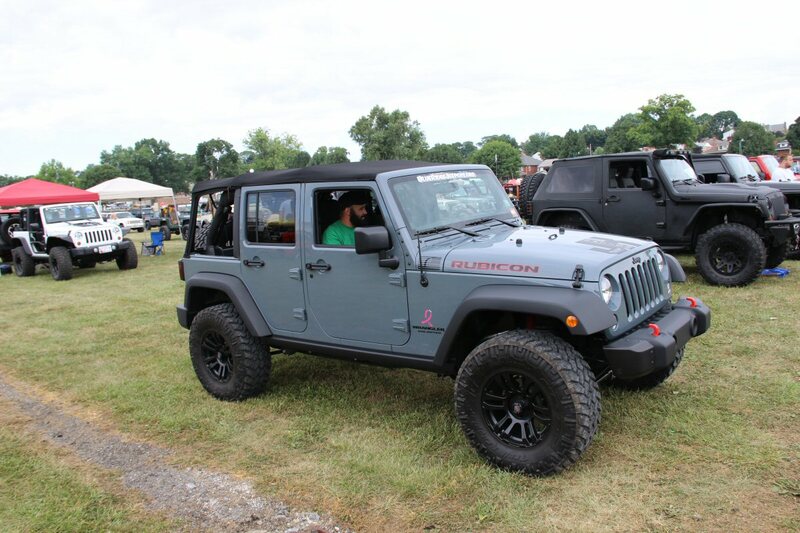 For the Full Offroaders.com Review as well as more information about the Maximus-3 Rear Tire Carrier Sport Package, check back soon to follow the link below as we break down our likes and dislikes of this tire Carrier. 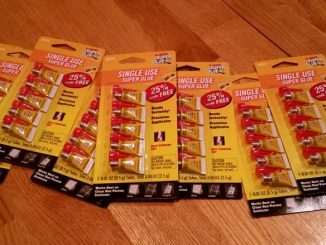 Thank you so, so, so, so much! This instructions helped me a a lot.